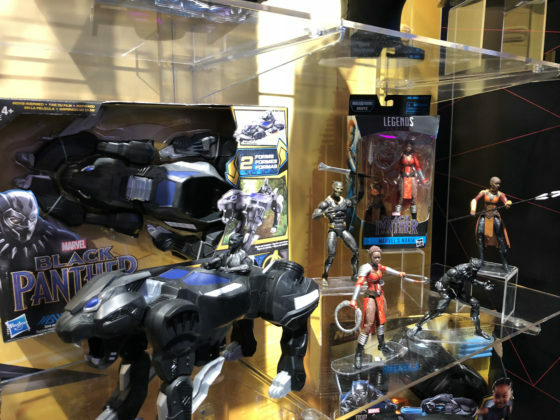 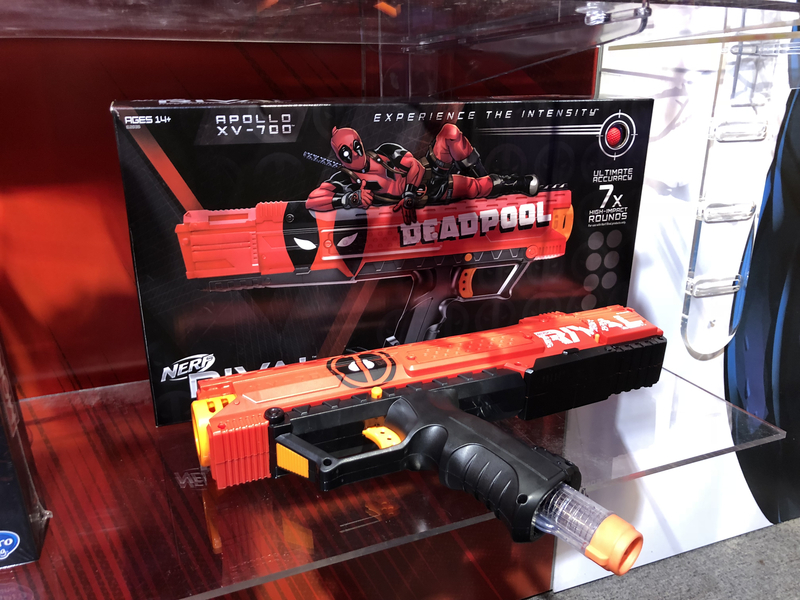 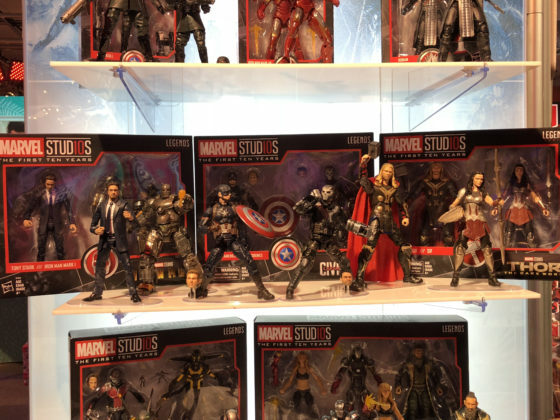 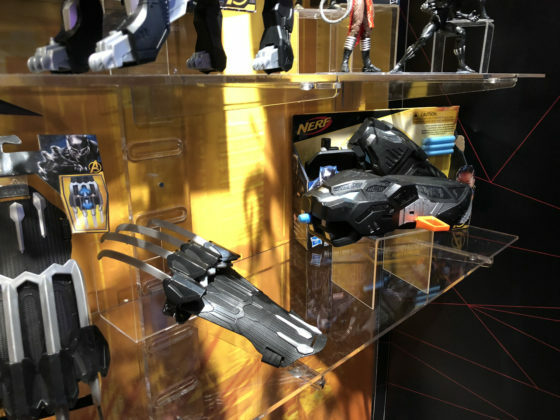 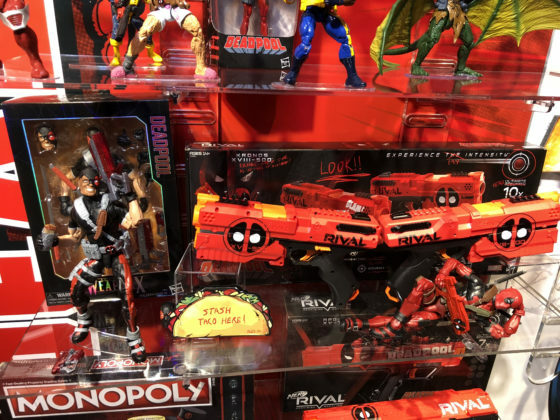 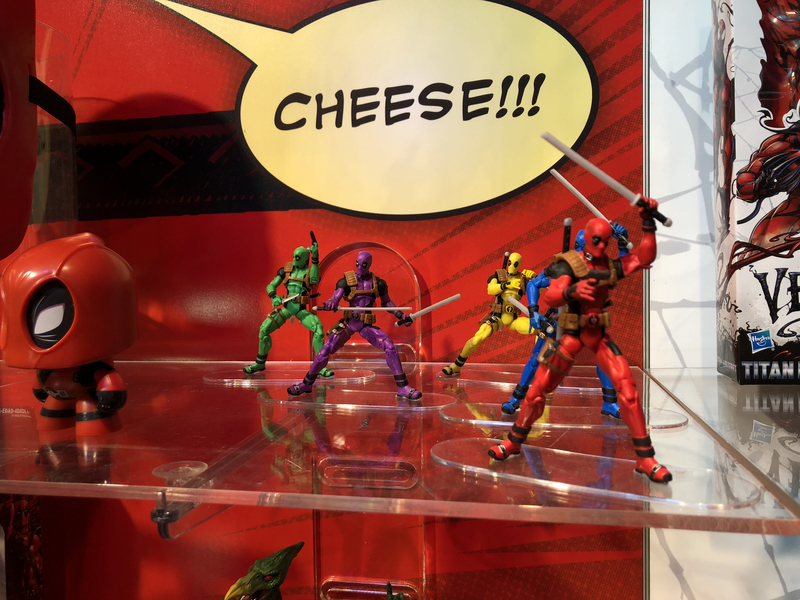 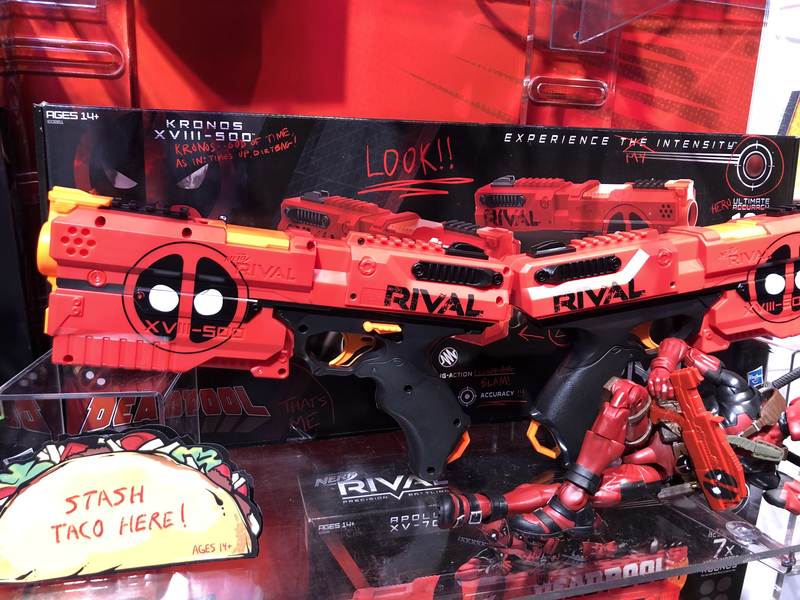 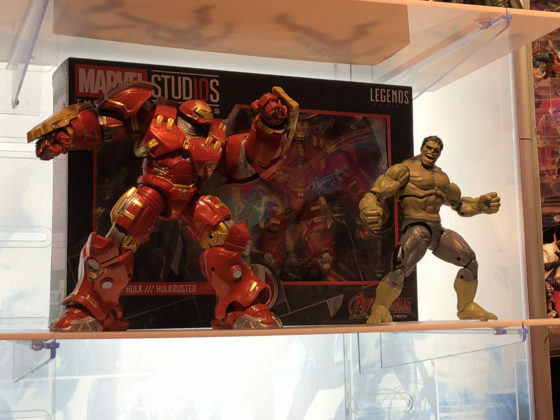 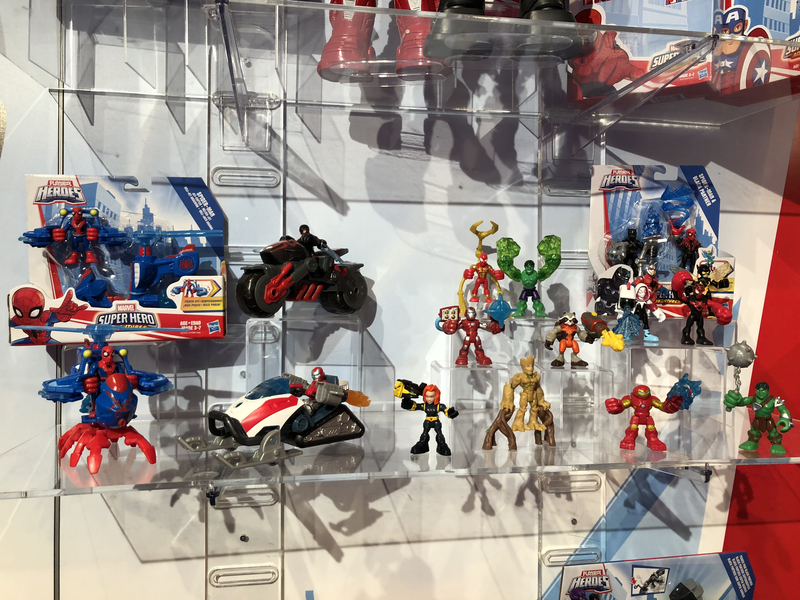 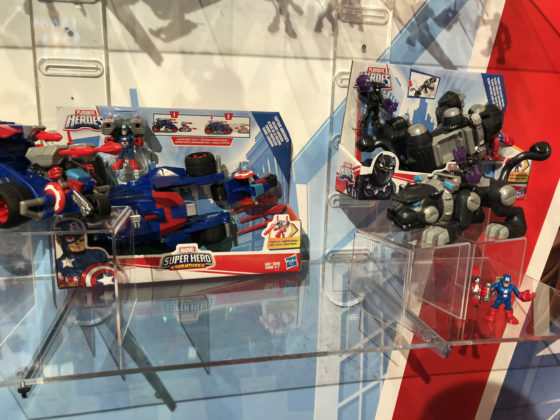 Year after year, Hasbro is the biggest highlight of Toy Fair because they make products for three of Disney’s biggest brands: Marvel, Star Wars, and Disney Princess and its adjacent properties. 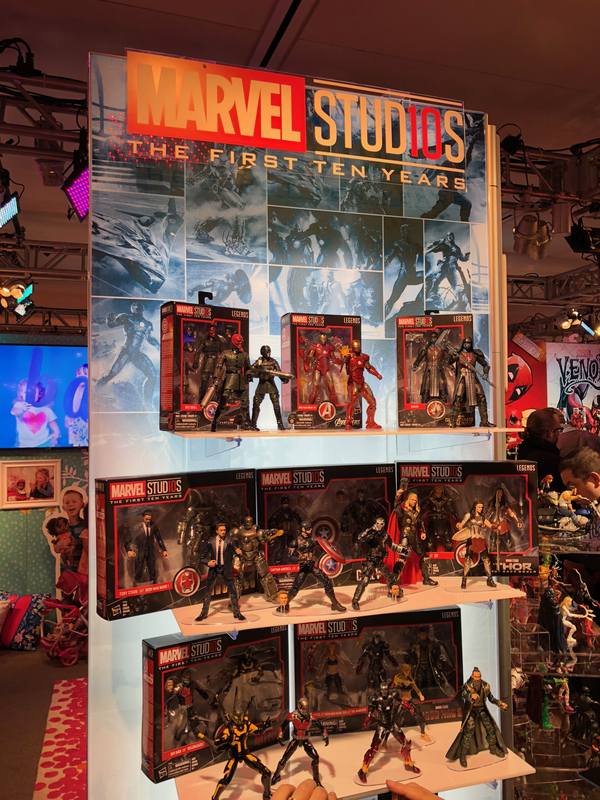 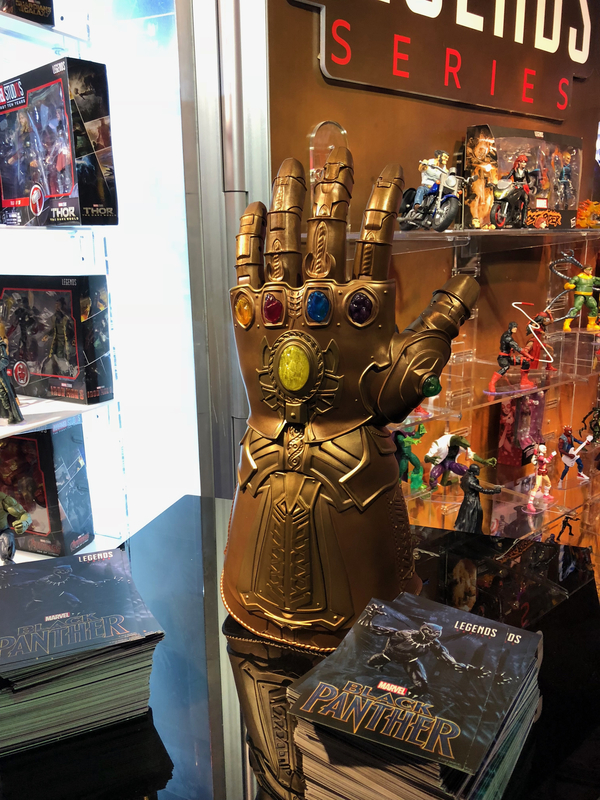 Their collection is so massive that they typically don’t have enough room to show it all off inside the Javitz Center with the rest of Toy Fair. 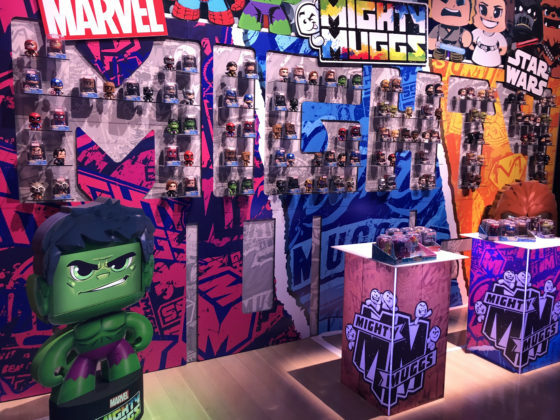 Instead, they host events at an off-site location where they blow me away annually with their innovative approach to toys for both kids and adults. One of the biggest surprises was the launch of a new app called Hasbro Pulse, which will make it easier than ever before for fans to get notified about new and upcoming releases. 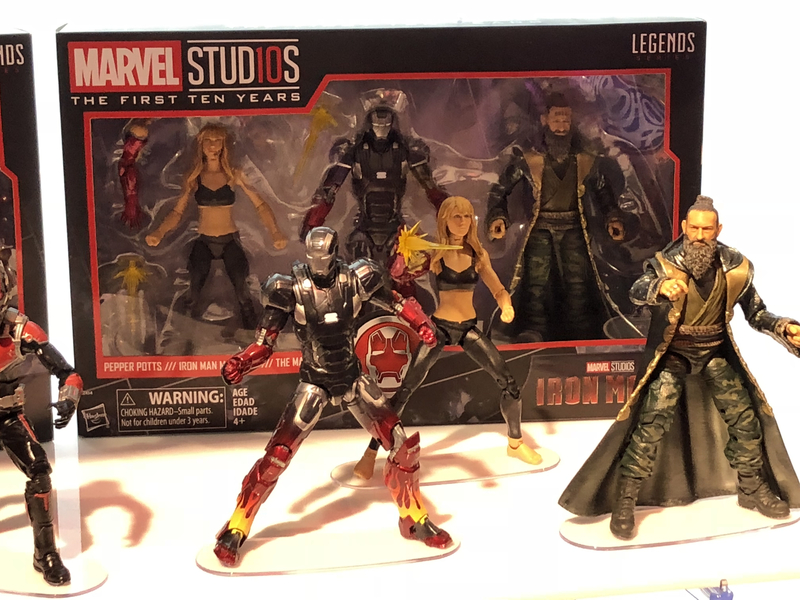 You can also track your toy collection digitally by scanning barcodes and their system is backdated ten years past for any Marvel and Star Wars products. 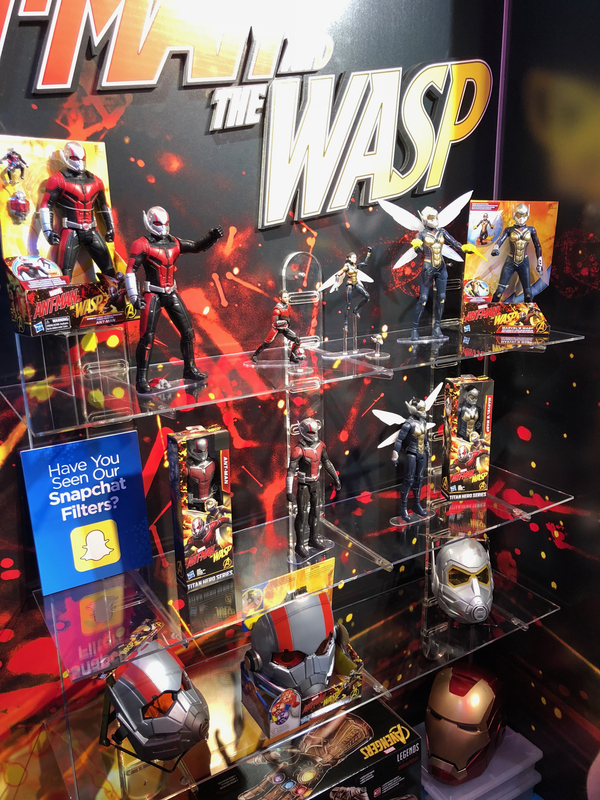 You can make wish lists to share with your friends and family, and can even purchase some items directly through the app. Best of all, the app is free. 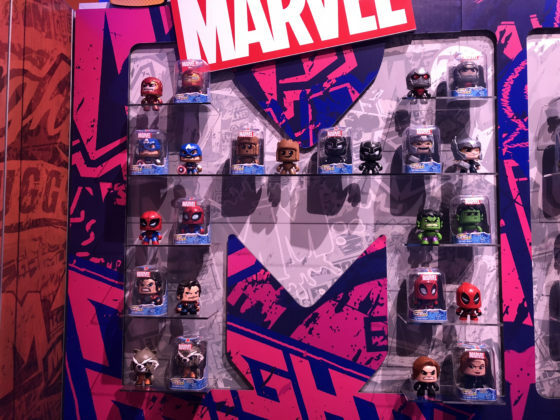 And now we dive into our first category, Marvel. 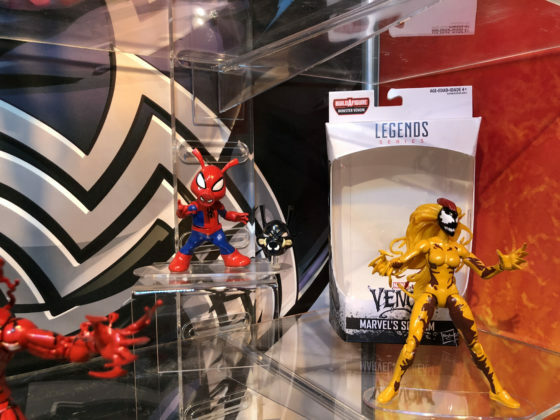 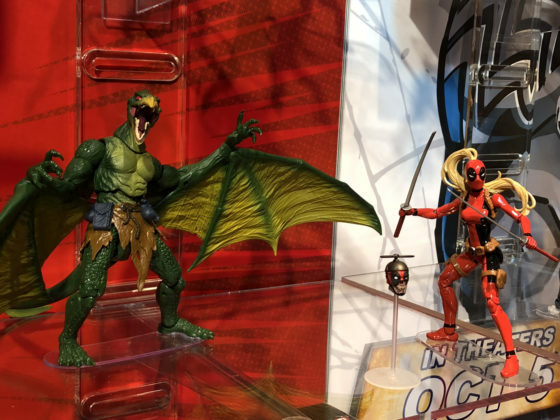 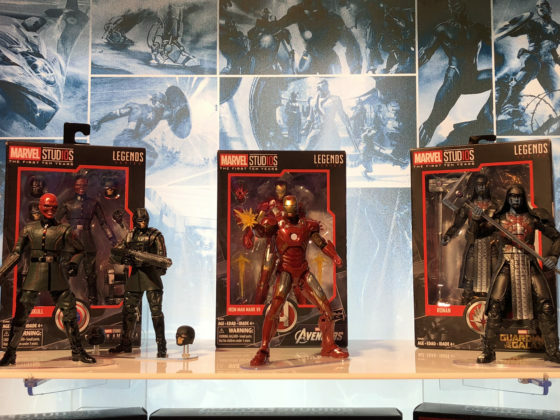 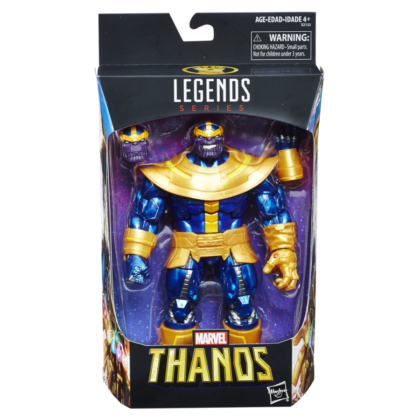 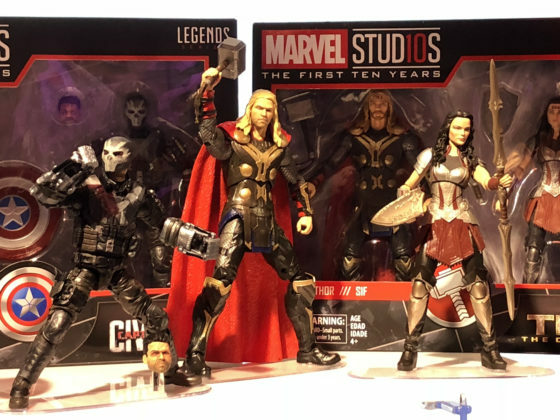 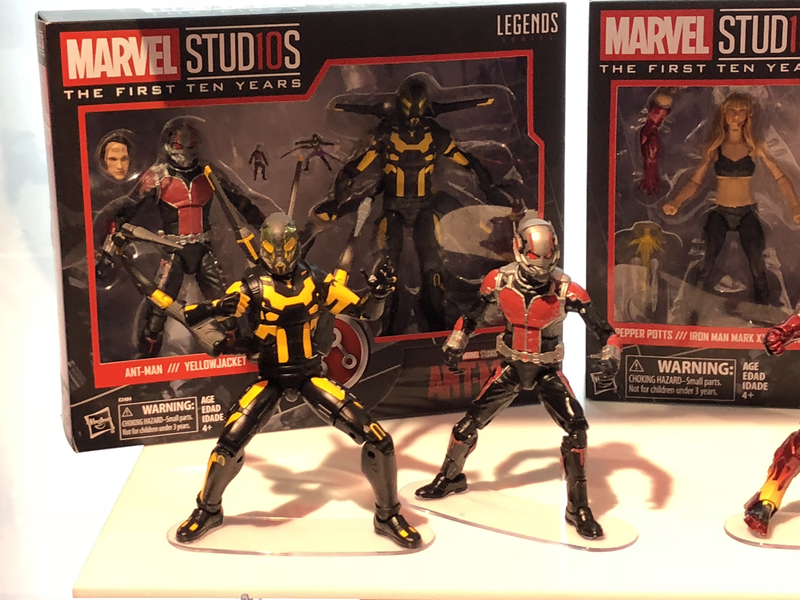 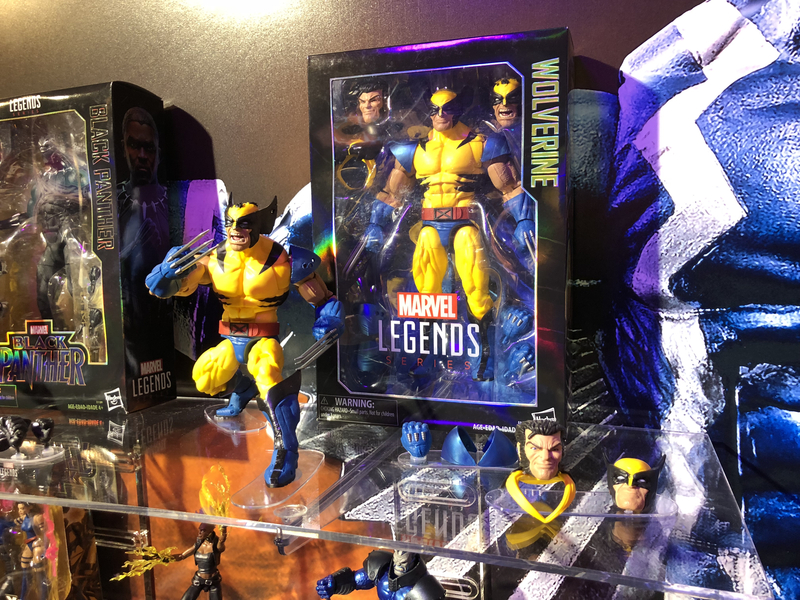 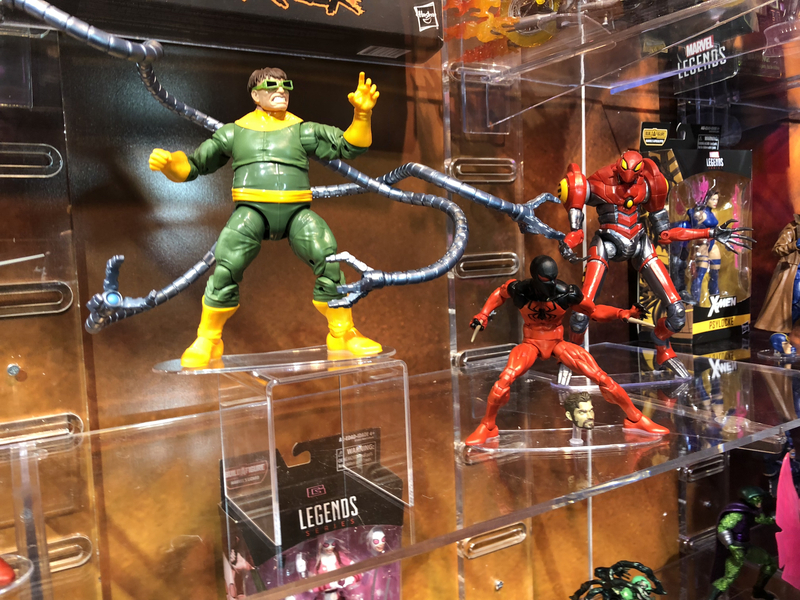 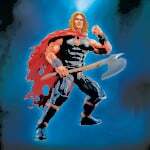 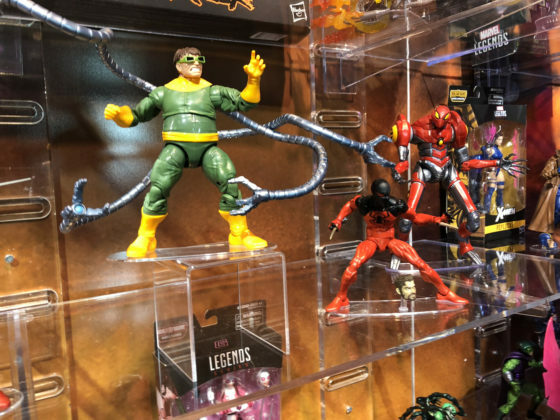 Marvel Legends, the premium collectible line of action figures aimed at adults, has so many releases coming up that I got lightheaded hearing about them all. It’s hard to even choose where to start, so I’ll go biggest to smallest. 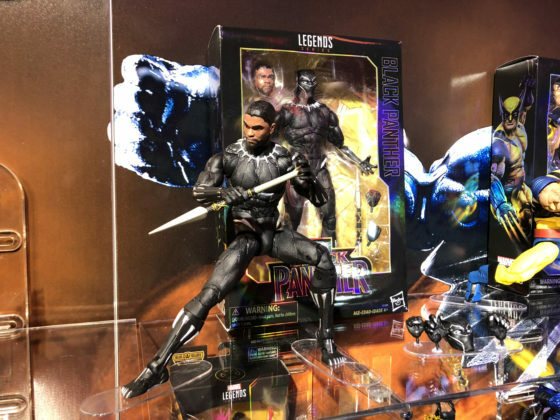 12-inch Black Panther and Wolverine make their debut this year, with Black Panther being the first movie inspired character in the 12-inch line. 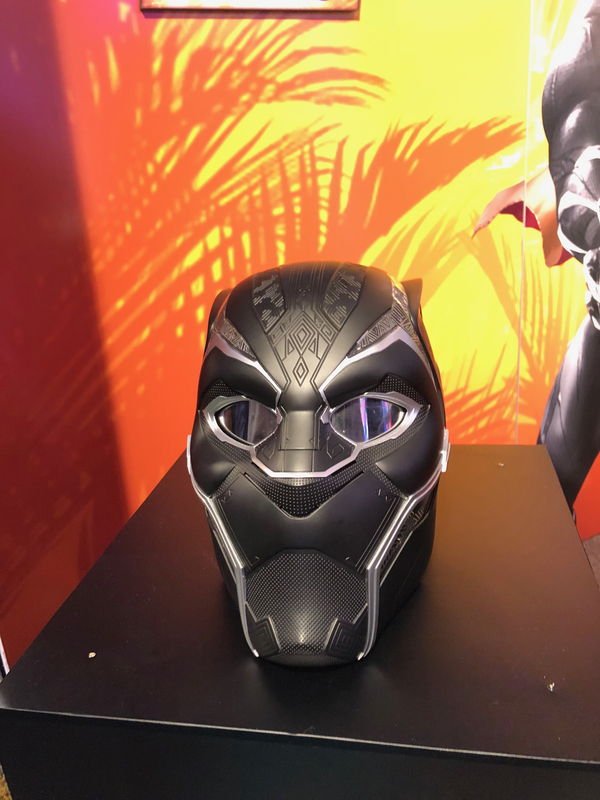 He uses the latest technology to create a lifelike swappable head of Chadwick Boseman. In the more common 6-inch series, a new line called “Ultimate Rider” pairs Marvel characters with their vehicles. 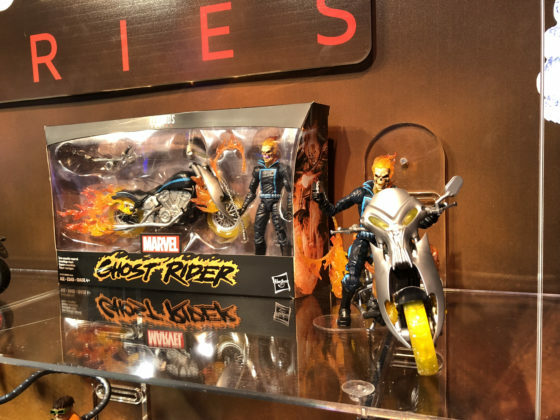 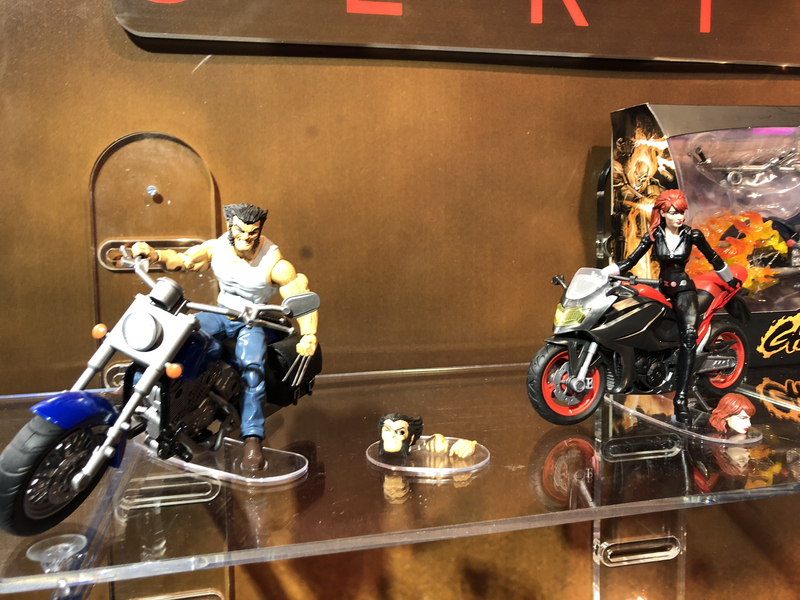 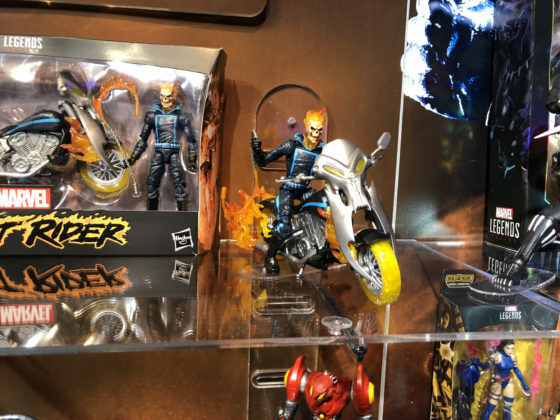 Hasbro promises that you will never see another Ghost Rider figure without his bike, and Ghost Rider is one of two figures in this introductory wave, in addition to Wolverine. 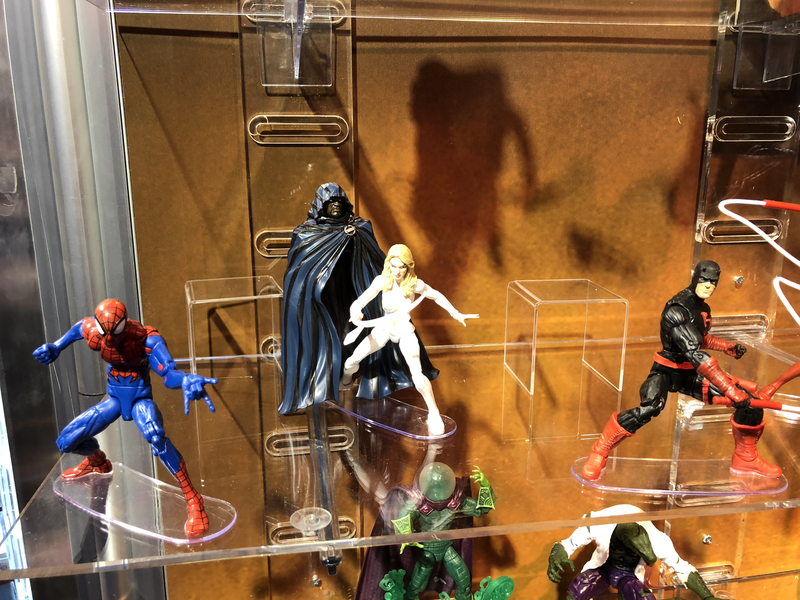 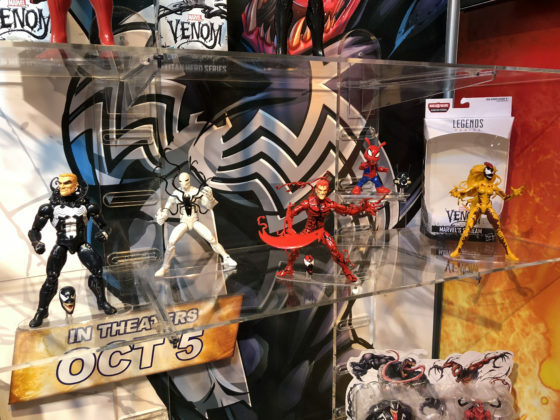 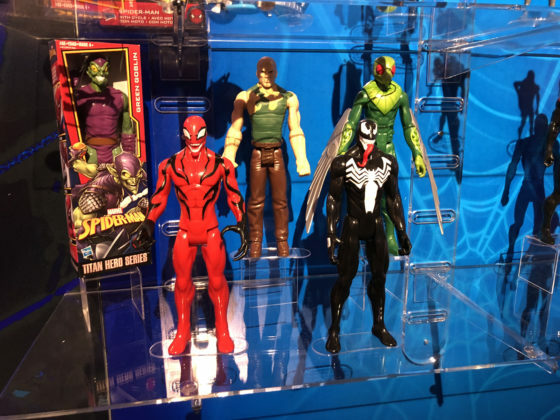 In wave 2 of the Spider-Man series, fans will find House of M Spider-Man, Scarlet Spider, Doc Oc, Cloak and Daggar, Daredevil and Electra. 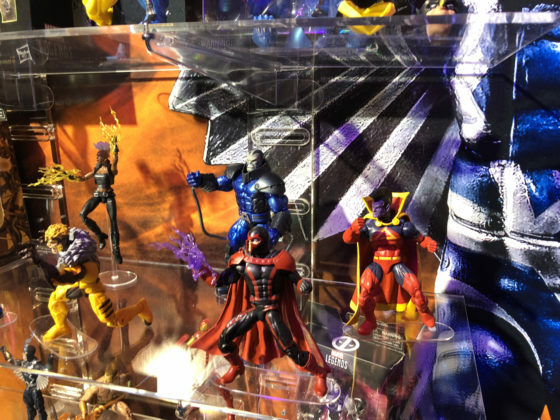 The Build-a-Figure in this wave is SPDR. 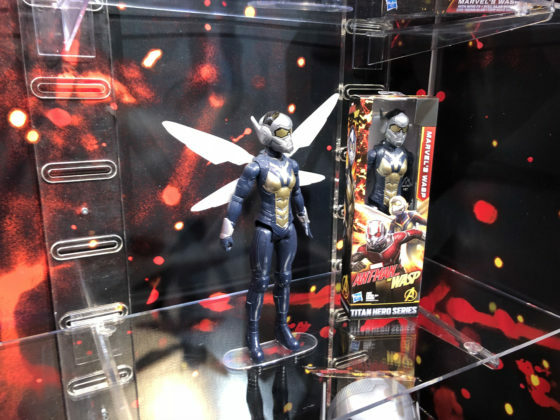 Wave 2 of Avengers: Infinity War features Black Knight, Malekith, Ant-Man, and Wasp figures. 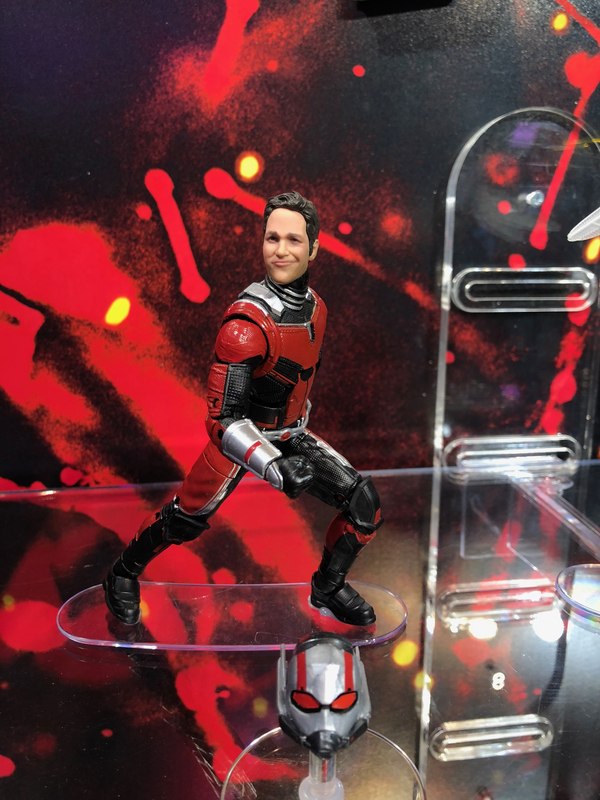 Like the 12-inch Black Panther, both of these last two figures have perfect likenesses to Paul Rudd and Evangeline Lilly. Another X-Men 6-inch line is coming soon, with a Build-a-Figure of Apocalypse when you collect the entire set. 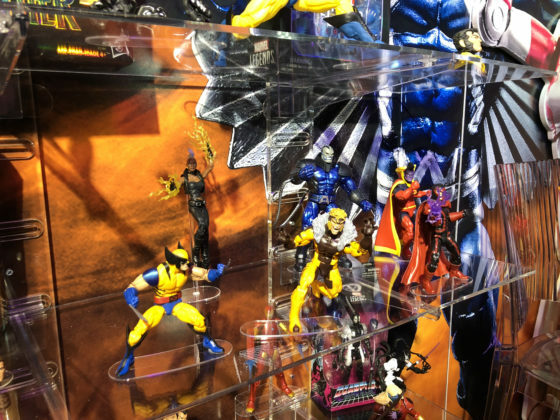 A new Magneto is part of the line with new effects in his hands, as well as Sabertooth, Psylocke, Storm, Gladiator, and Tiger Stripe Wolverine. 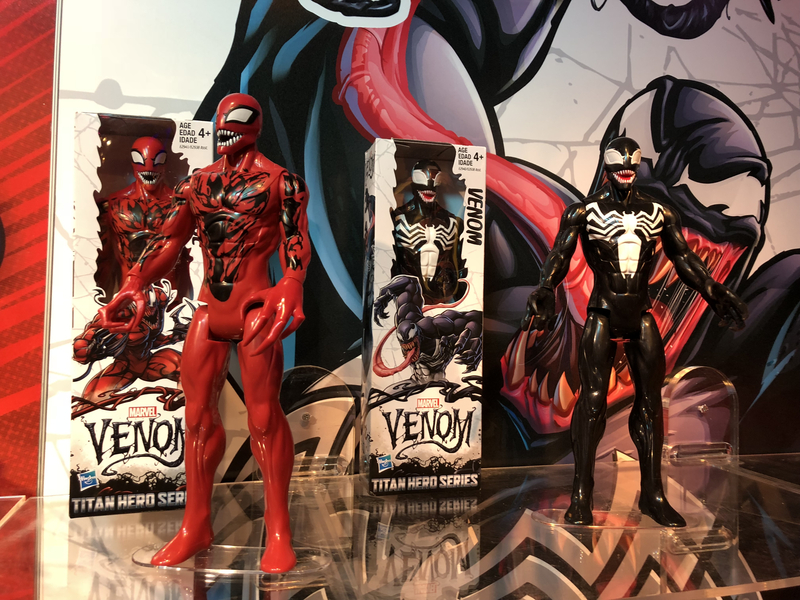 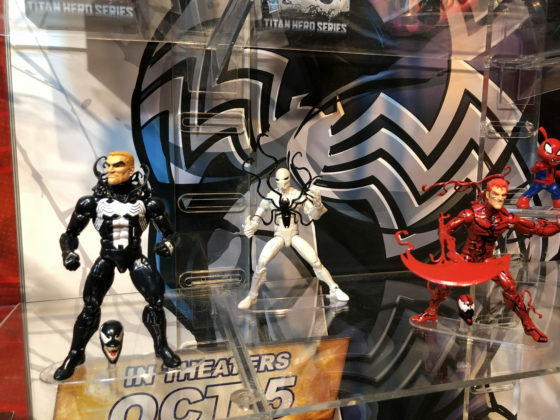 This Fall, Sony’s Venom movie hits theaters and Hasbro has a Marvel Legends Venom collection, with a Build-a-Figure that will be announced at a later date. 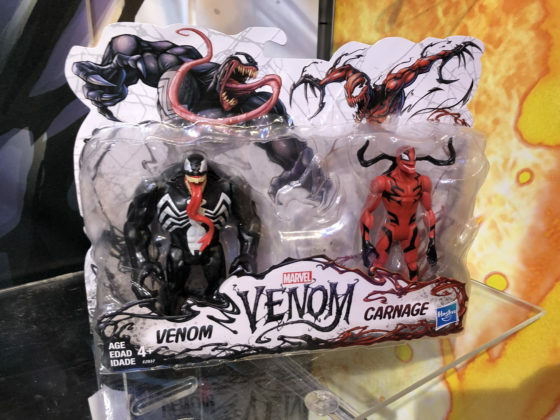 This collection features Venom, Carnage, Scream, Poison, and Spider-Ham. 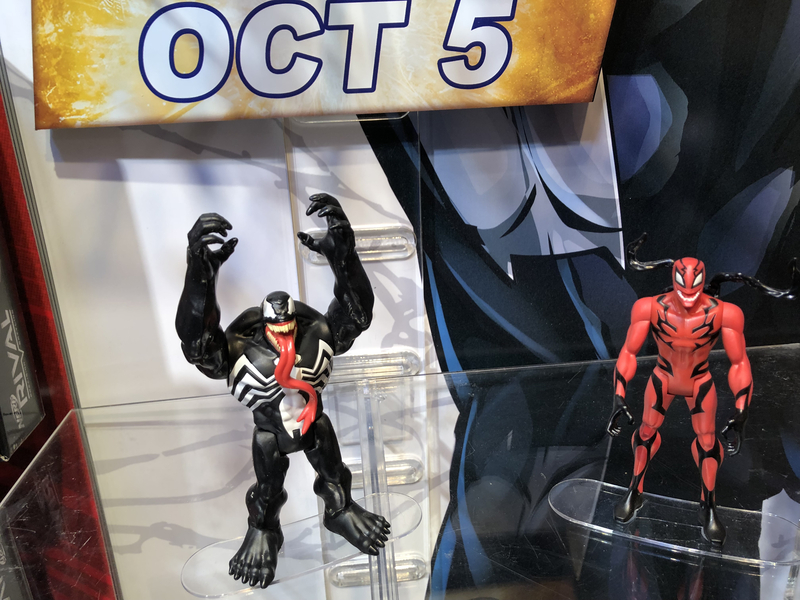 There are other Venom toys aimed at kids that were in this same display. 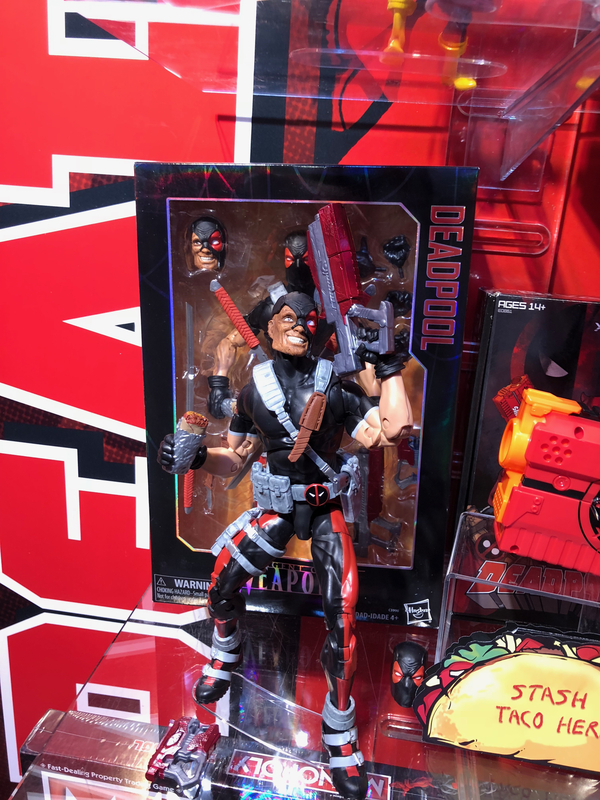 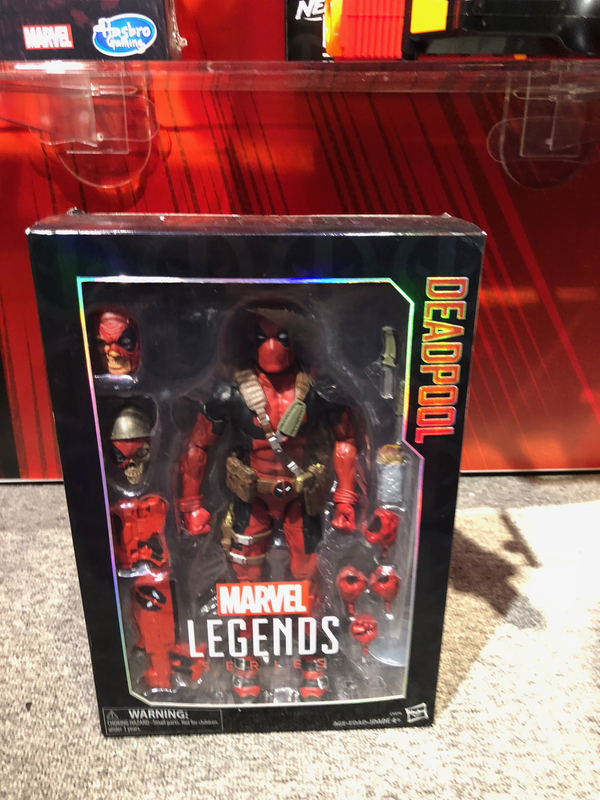 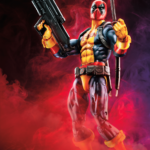 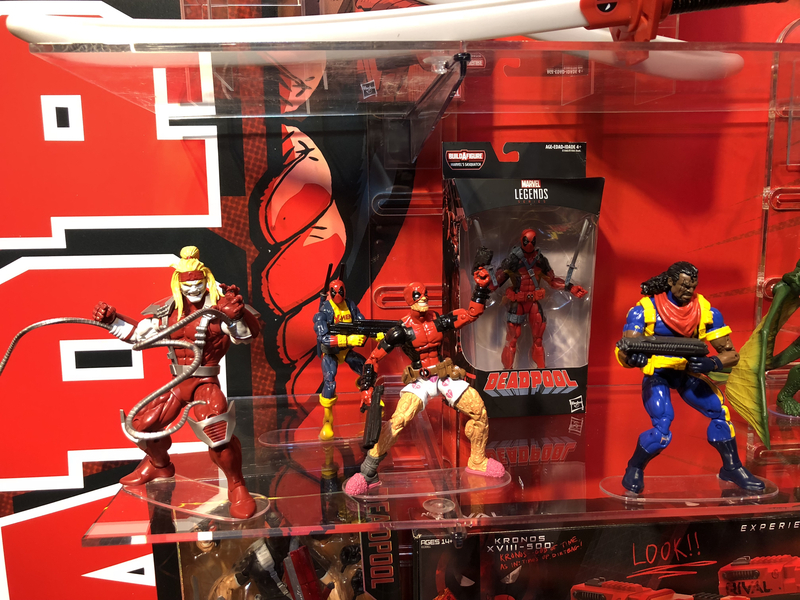 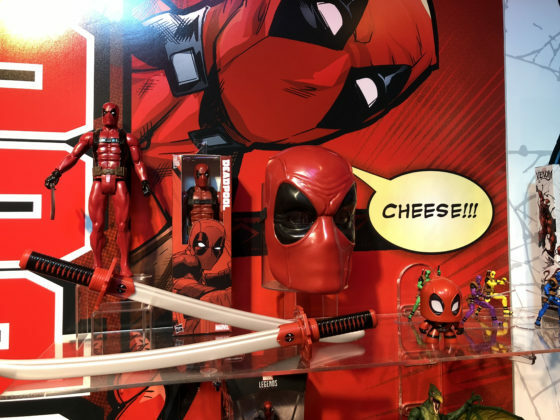 Deadpool 2 is also on the release schedule from Fox, and wave 2 of Deadpool will feature Omega Red, Deadpool’s X-Force costume (Toy’s “R” Us Exclusive), Lady Deadpool, Bishop, and a Deadpool who forgot to put on pants. The Build-a-Figure in this wave is Sauron. 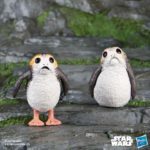 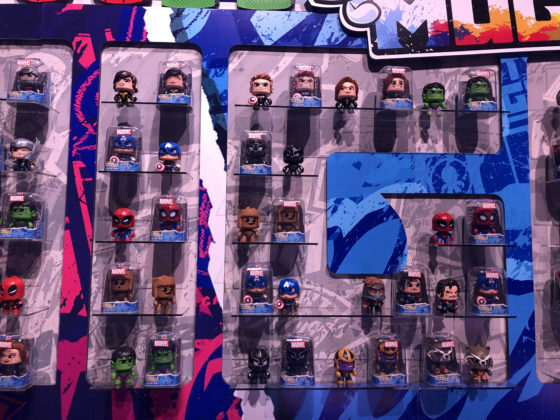 There will also be two 12″ Legends figures in this line. For kids, there are play weapons, masks, and action figures. 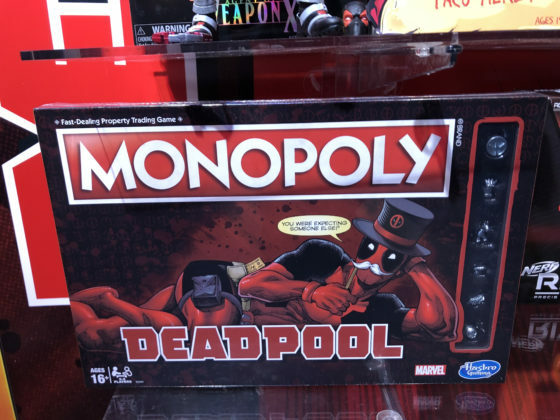 PSA: Deadpool 2 will be rated R. Lastly, Deadpool Monopoly is sure to be hilarious. 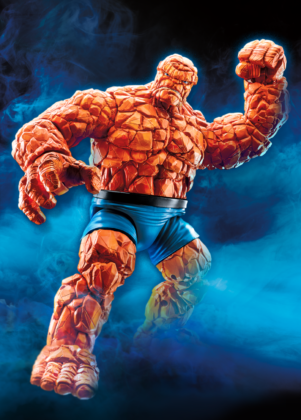 To celebrate the 10th anniversary of Marvel Studios, Marvel Legends is releasing ten sets themed to ten of the films. An Iron Man 2-pack provides a new sculpt of Robert Downey Jr.’s head along with a Mark I, Iron Man’s Mark VII from The Avengers, a 3-pack from Iron Man 3 with Pepper Potts and Mandarin (Toy’s “R” Us Exclusive), Ronan from Guardians of the Galaxy (Game Stop exclusive), Avengers: Age of Ultron Hulkbuster vs. Hulk (Target exclusive), and Captain America: Civil War 2-pack with Cross Bones and a new Chris Evans head. The tenth piece is themed to Avengers: Infinity War, which will be revealed later. In that last section, you may have noticed quite a few store exclusives and Hasbro has a few more retailer specific releases that aren’t part of a wave. 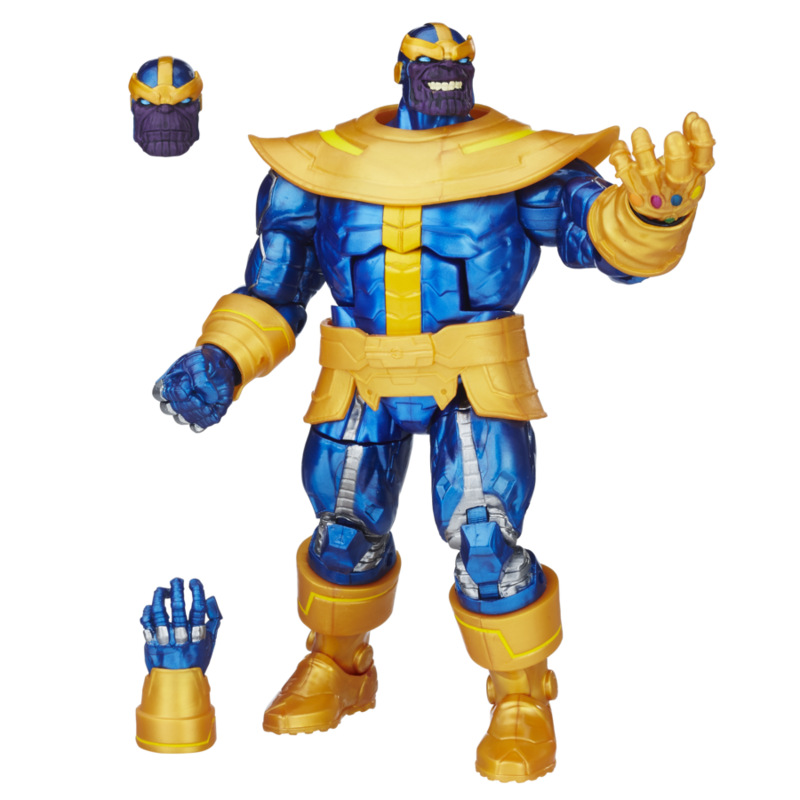 Wal Mart will have a Thanos figure in time for Avengers: Age of Ultron. 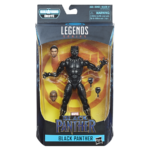 Target has the Black Panther 2-pack with Killmonger and Everett Ross. Toys “R” Us has a Black Panther Shuri/Klaw 2-pack and an upcoming X-Men: Days of Future Past Wolverine and Sentinel 2-pack. 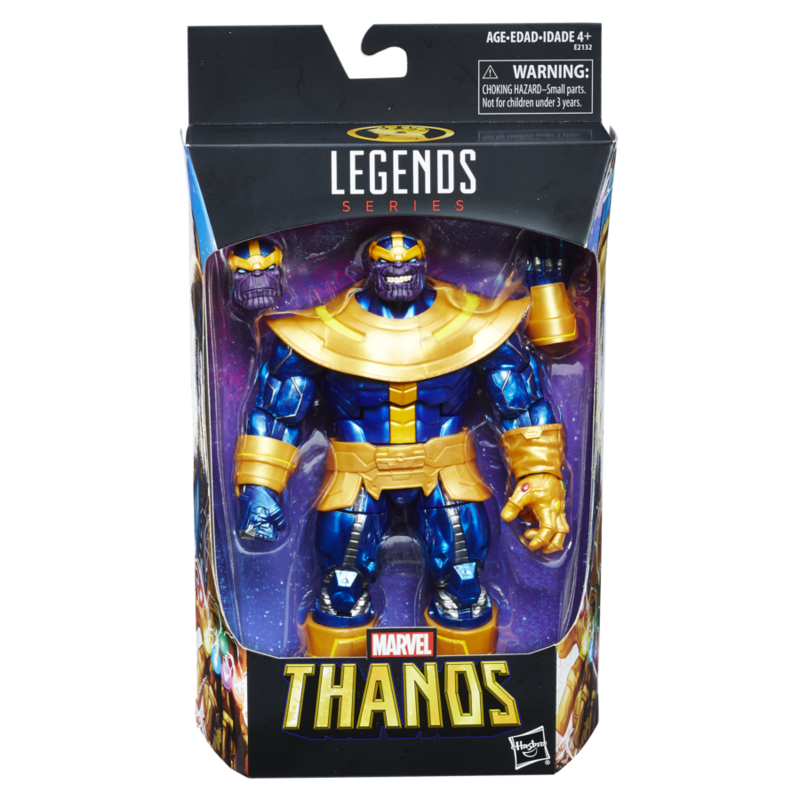 Lastly, Walgreens will have Thing, Mr. 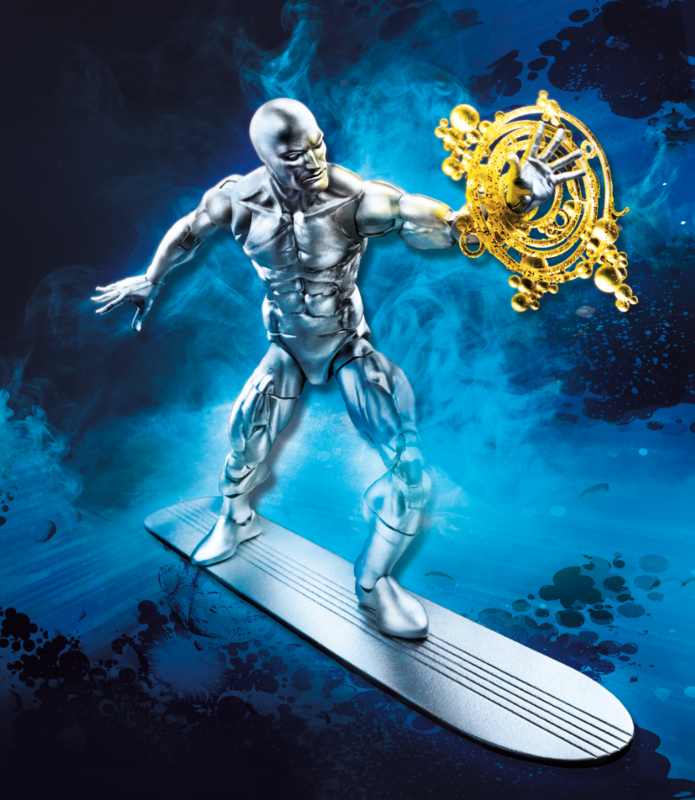 Fantastic, and the Silver Surfer. 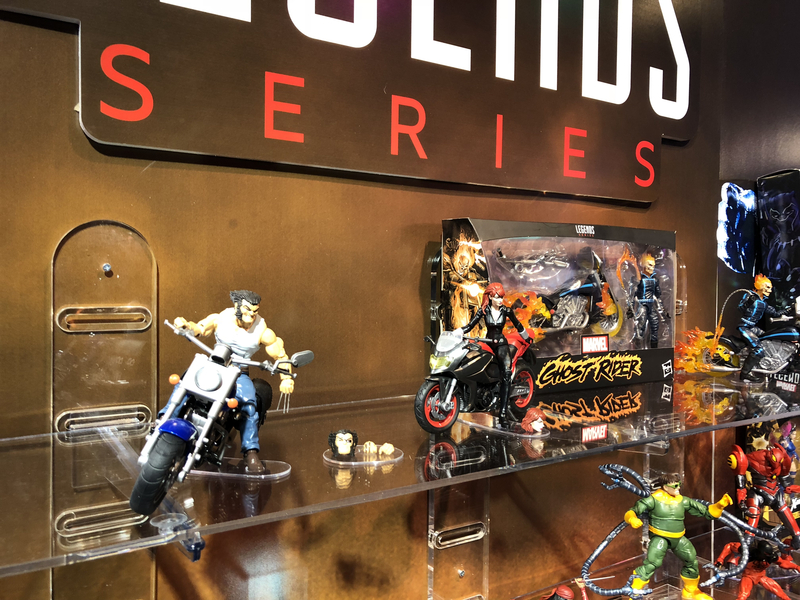 Two new premium role play items are also coming for adult collectors. The Black Panther helmet uses a flexible back to securely place it on your head without any locking hinges. 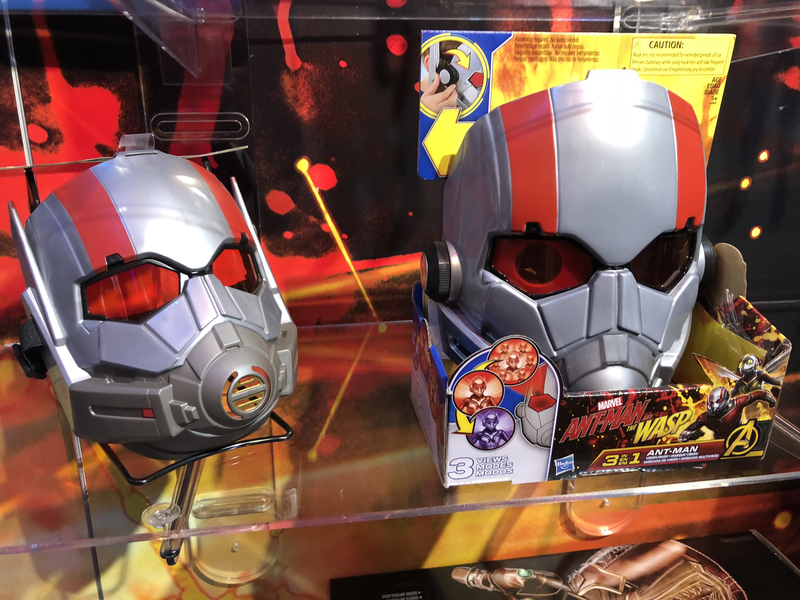 It lights up like his suit in the film at the push of a button and the eye shields can be opened or closed at your command. 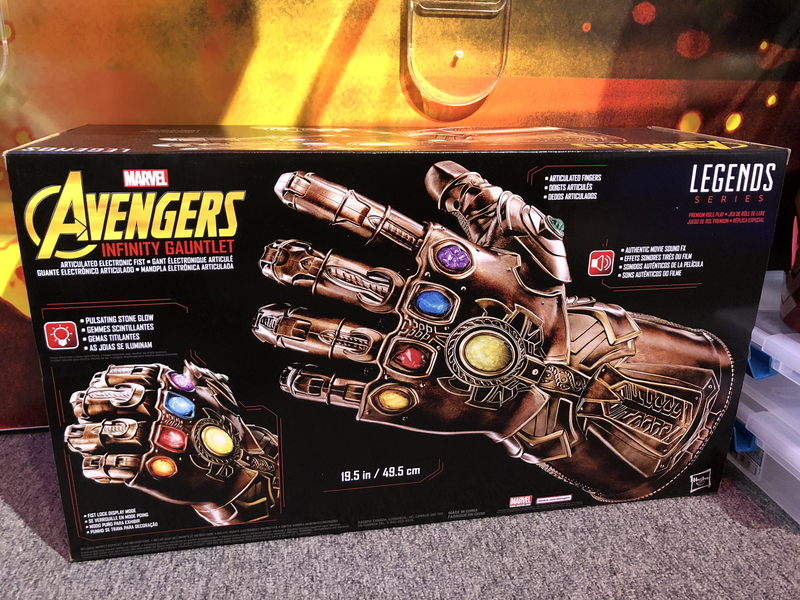 The Infinity Guantlet is 18-inches long and features real sounds from the film, Avengers: Age of Ultron. Your fingers can control the glove’s fingers and with it, you can rule the galaxy. 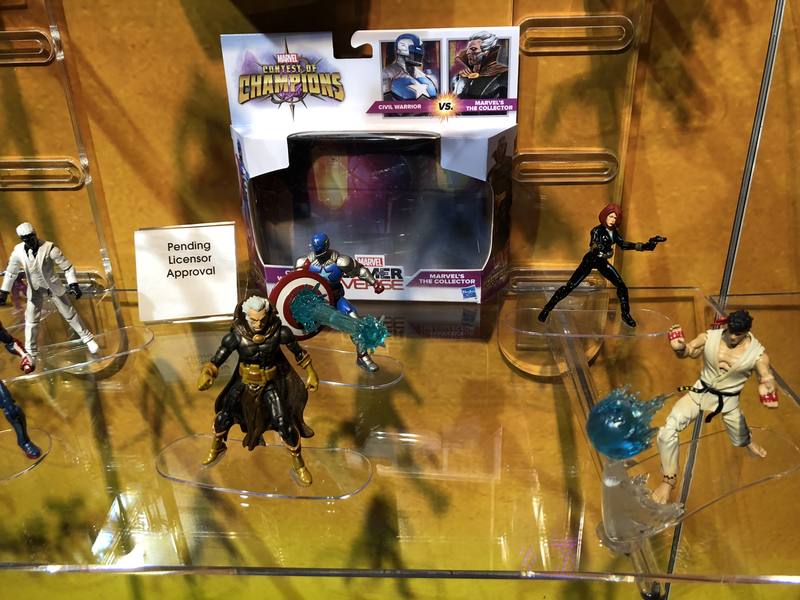 Video game fans will be interested in the Marvel Gamerverse line of action figures, based on Marvel vs. Capcom and Contest of Champions. 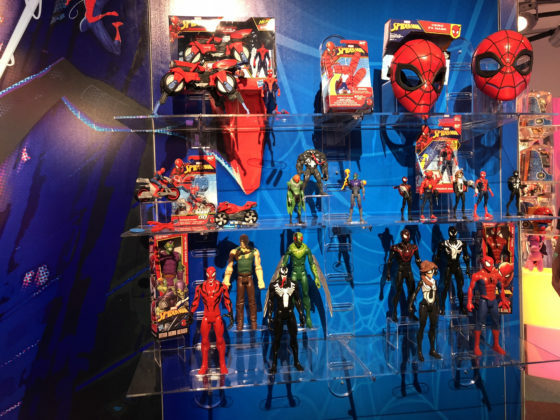 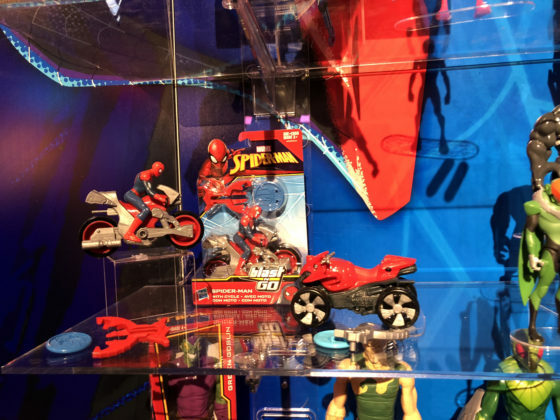 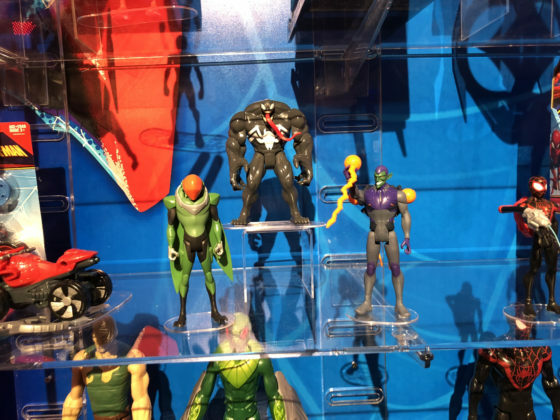 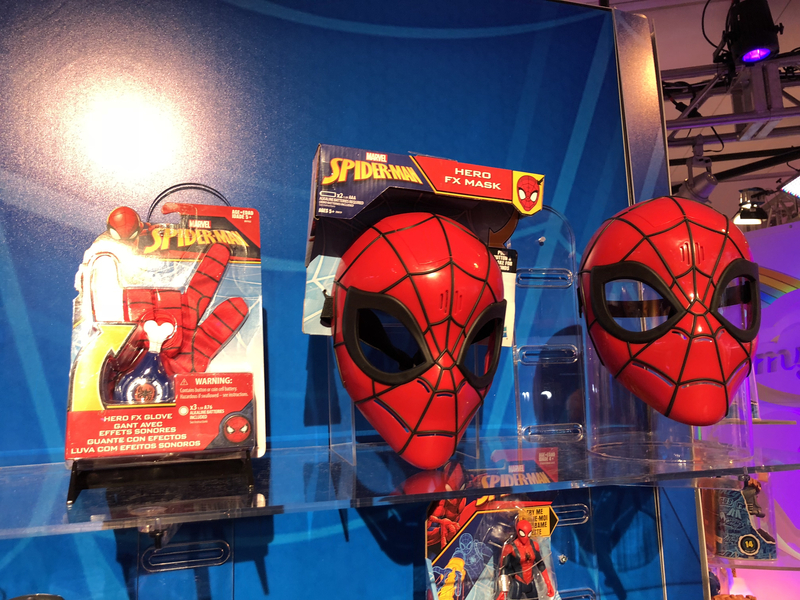 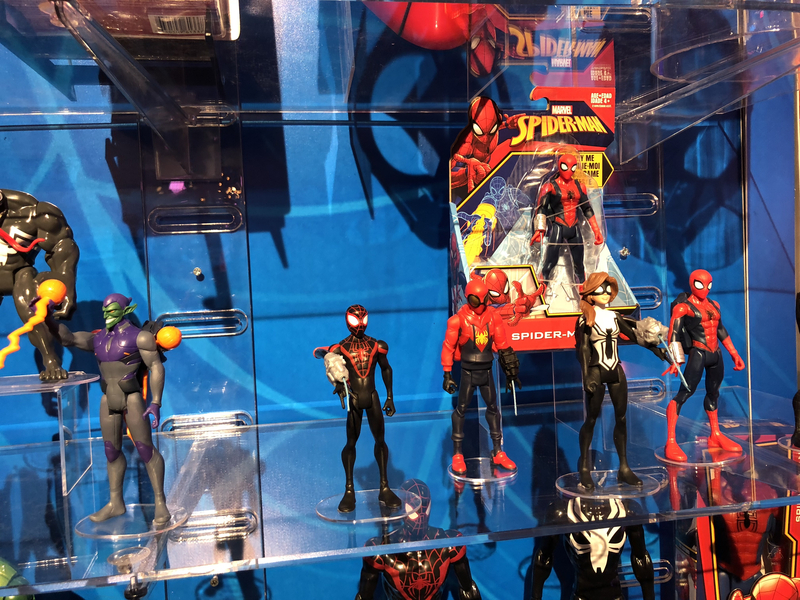 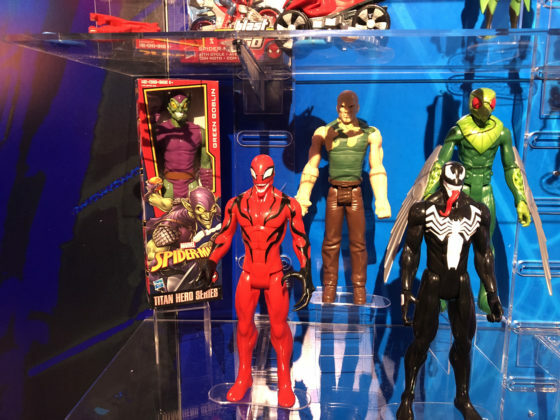 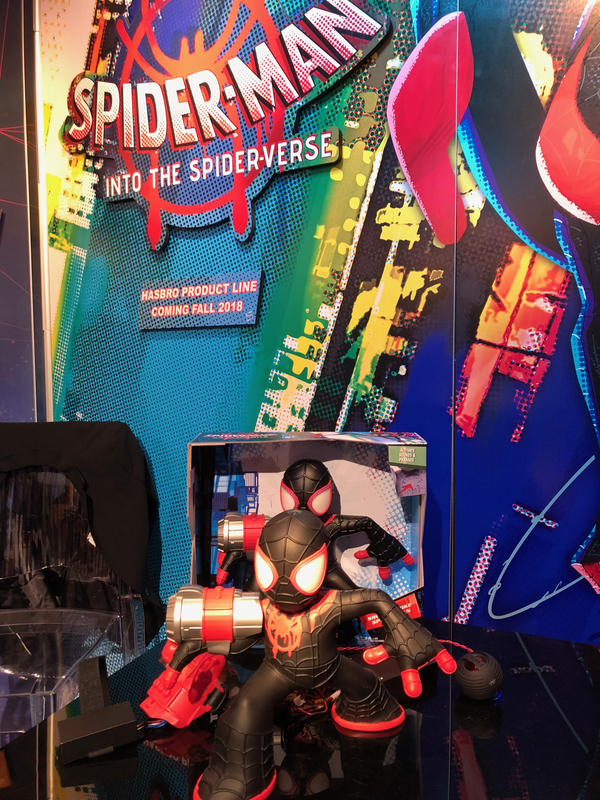 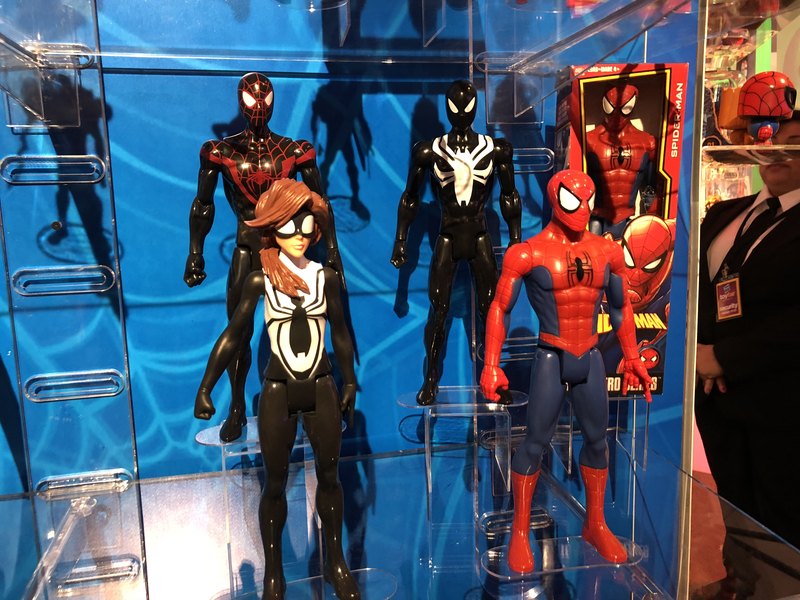 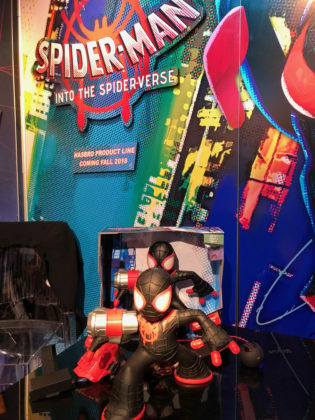 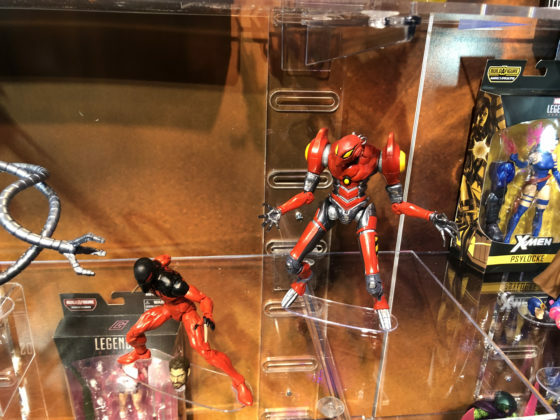 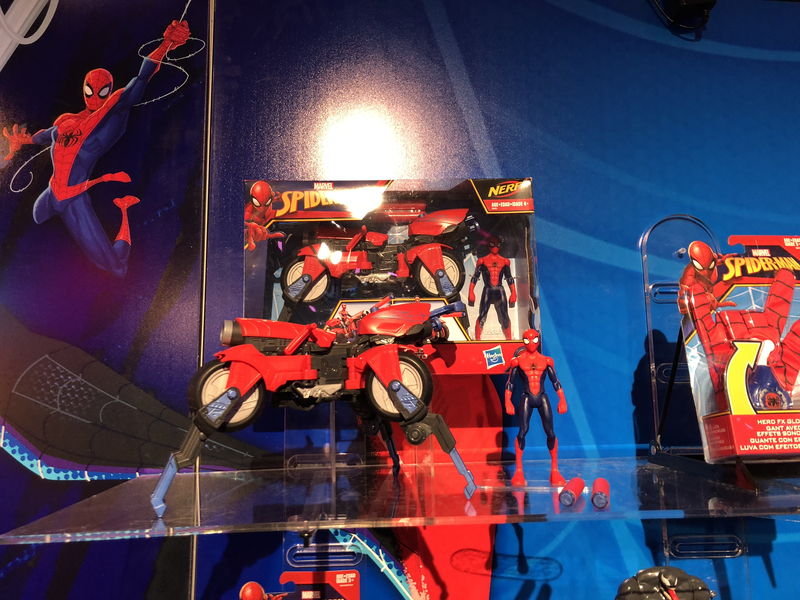 Moving away from the adult collectors market, a new line of toys themed to the Sony animated film Spider-Man: Into the Spider-Verse will launch a new toy line. Spider-Man also remains an evergreen toy property with classics like the web slinger and Titan Hero Series figures available. 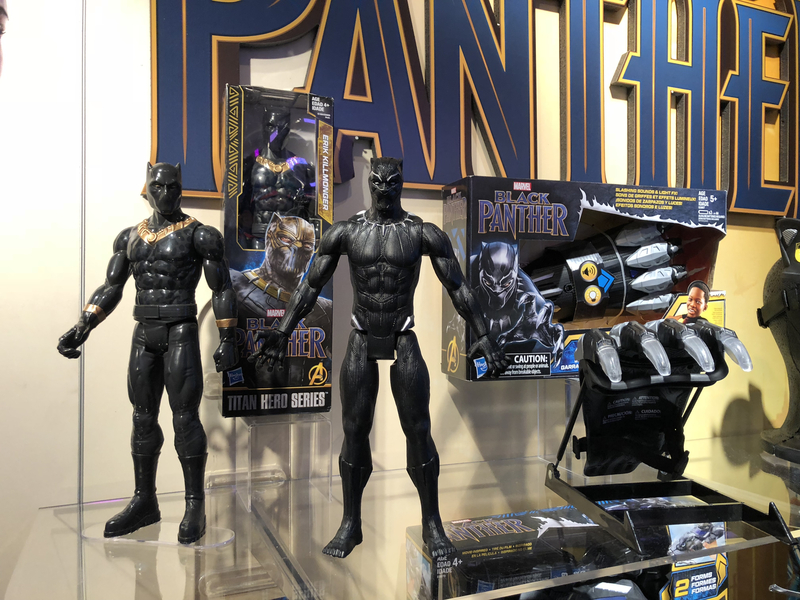 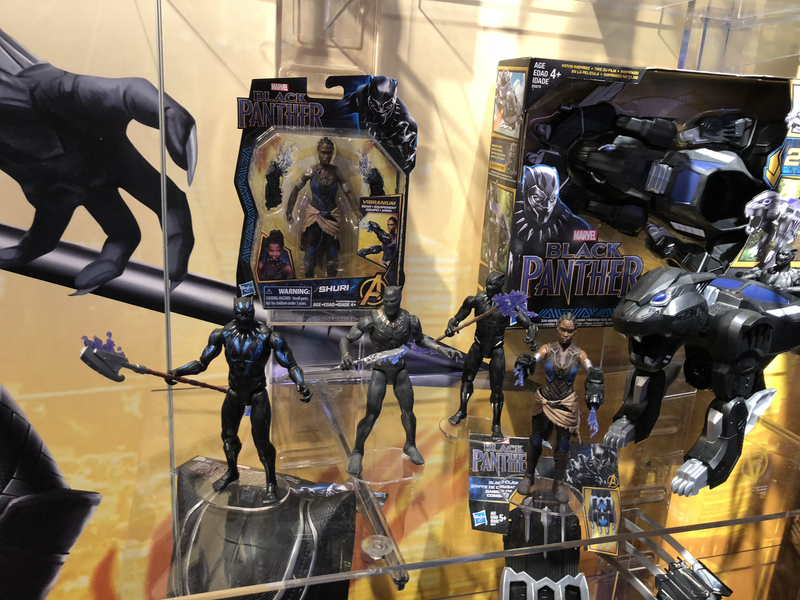 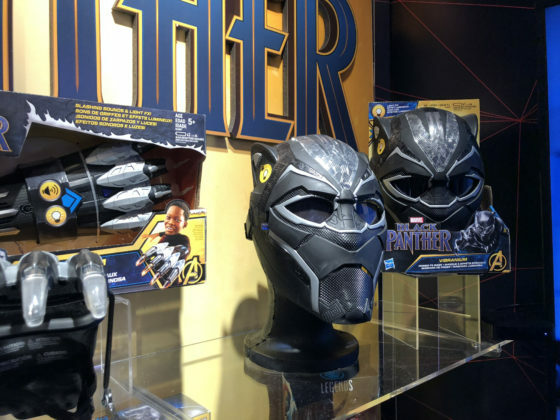 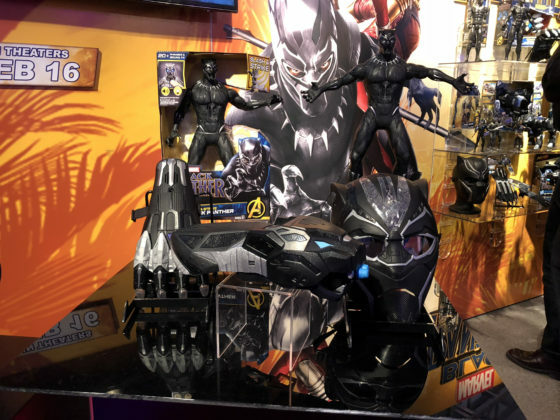 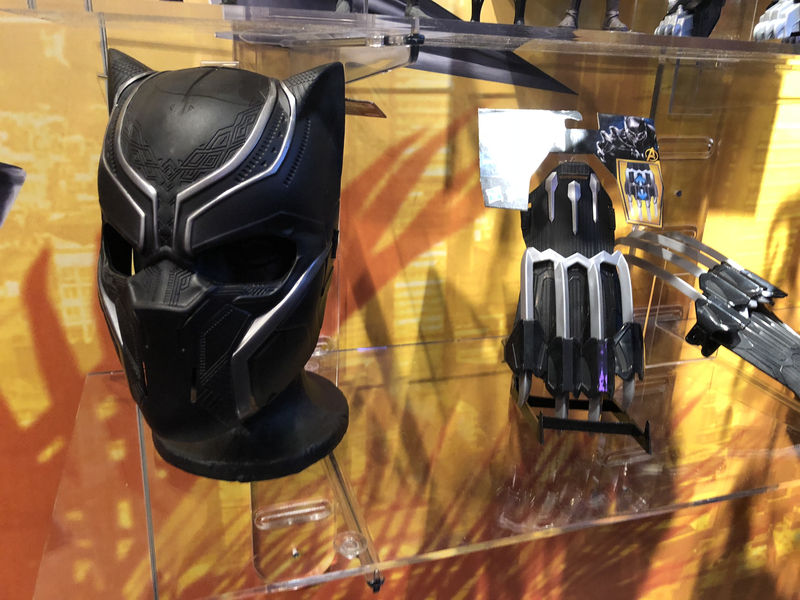 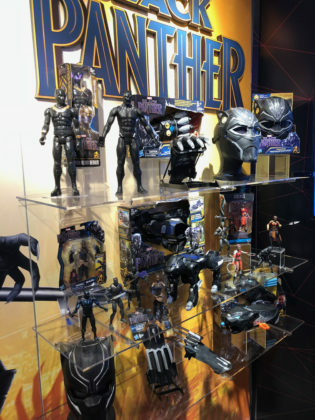 Black Panther is also celebrated with a toy line of pretend play items and action figures. 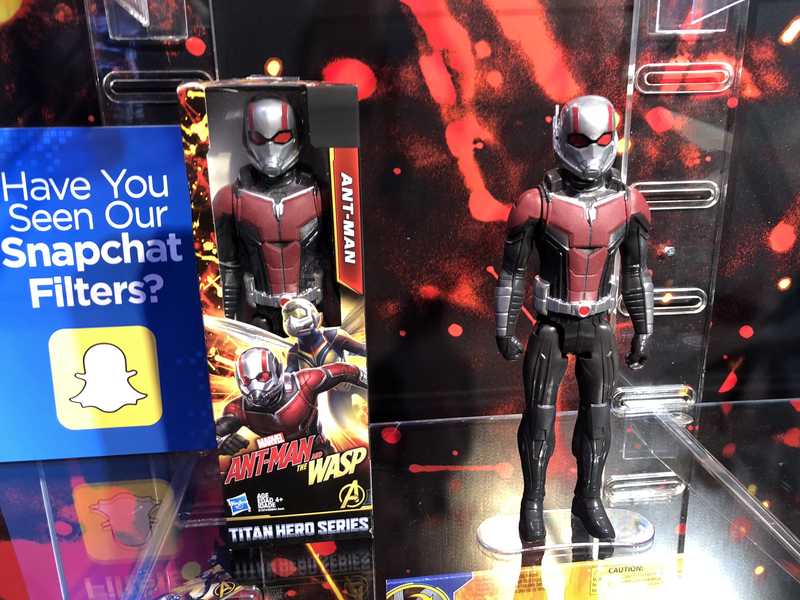 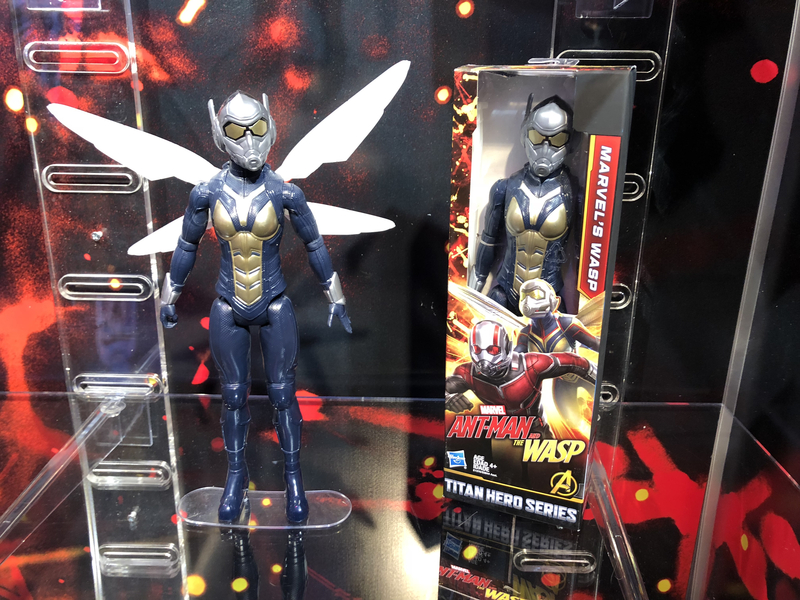 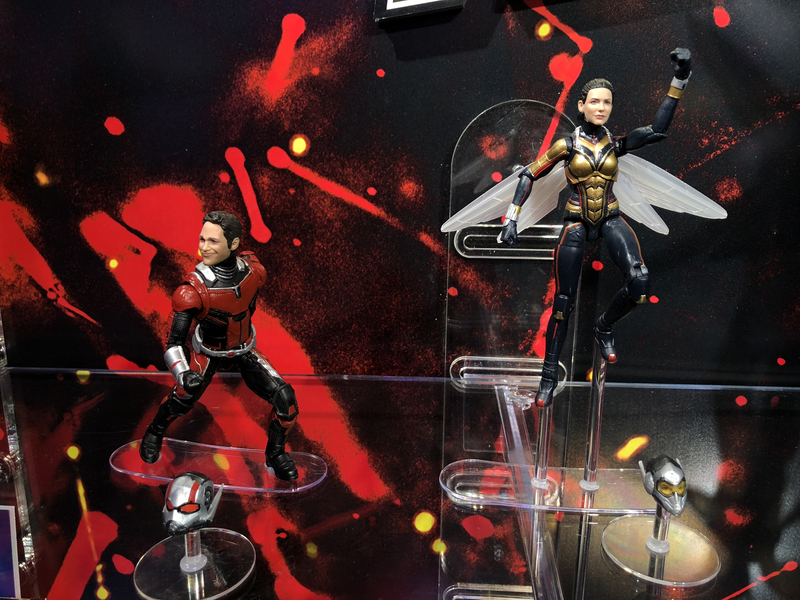 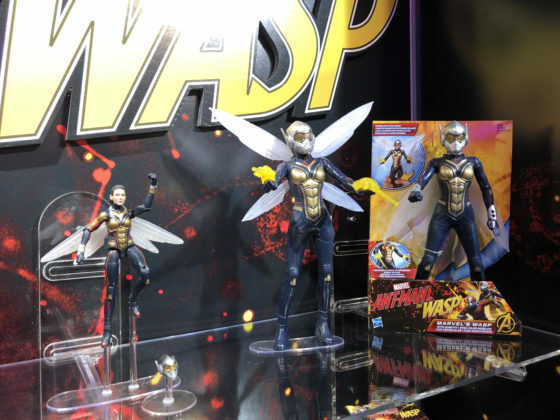 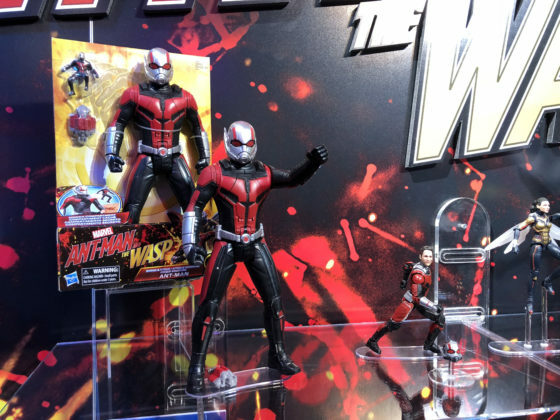 When Ant-Man and the Wasp hits theaters this summer, kids will find more pretend play and action figure items to step into the roles of both heroes. 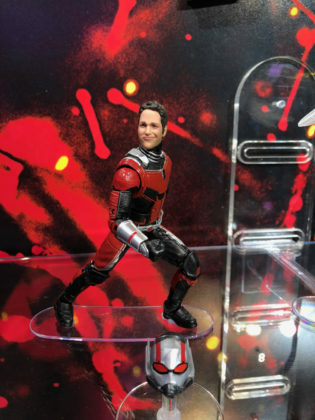 Of particular interest is the “Shrink & Strike Ant-Man” figure, which shoots out a smaller version of himself. 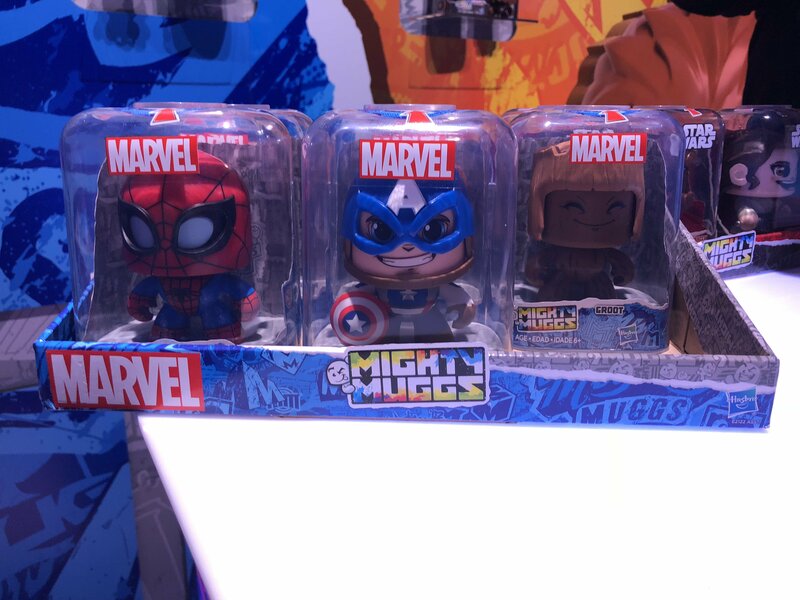 Hasbro’s Mighty Mugs line of face-spinning characters launched last year with Star Wars. Marvel gets in on the action in 2018 with many characters joining the line. 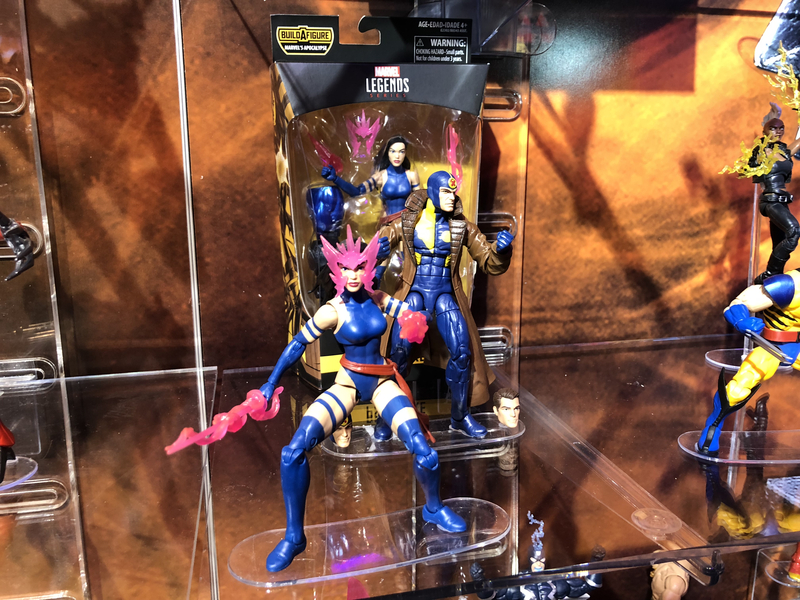 Each figure has three expressions. Pushing a button on top of their head rotates the face to the next emotion. 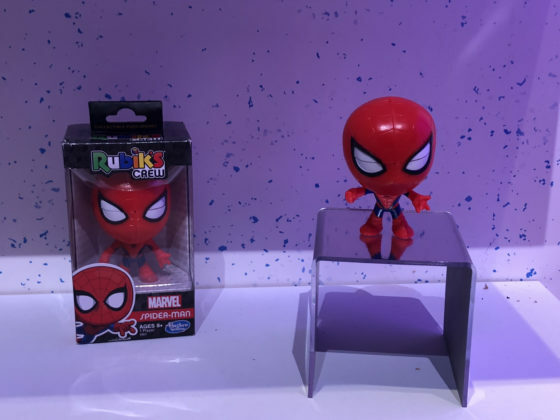 They’re a really fun desk tchotchke. 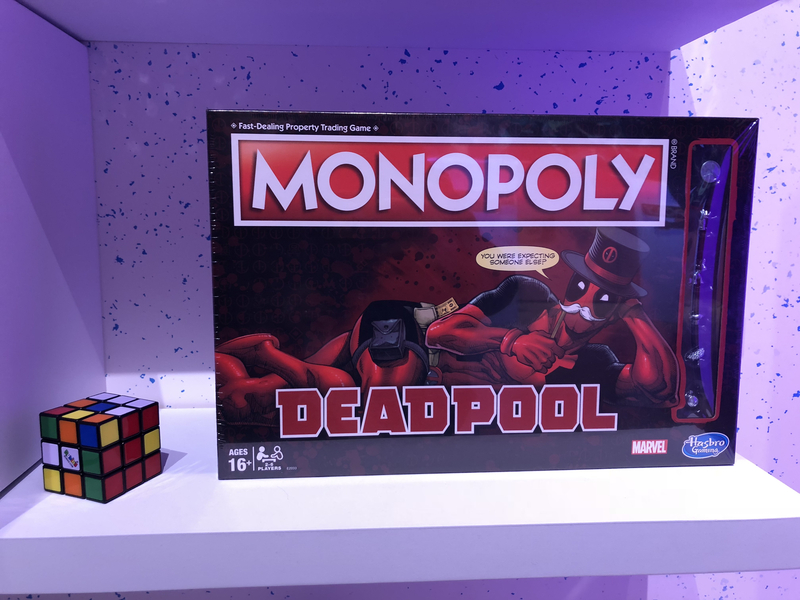 Monopoly adds a new level of wacky hilarity with a Deadpool edition and Rubick’s Cube gets reimagined as Spider-Man in the new Rubick’s Crew line. 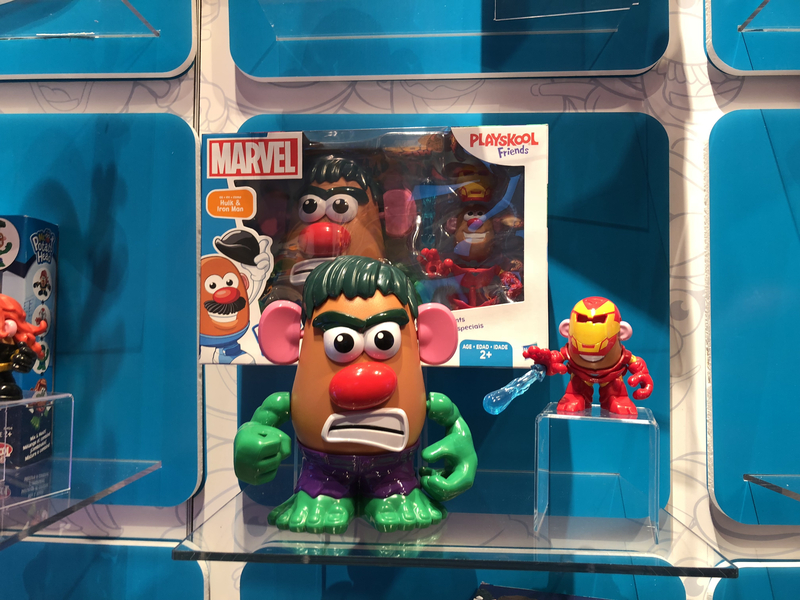 Preschoolers can enjoy Marvel fun with a few products as well. 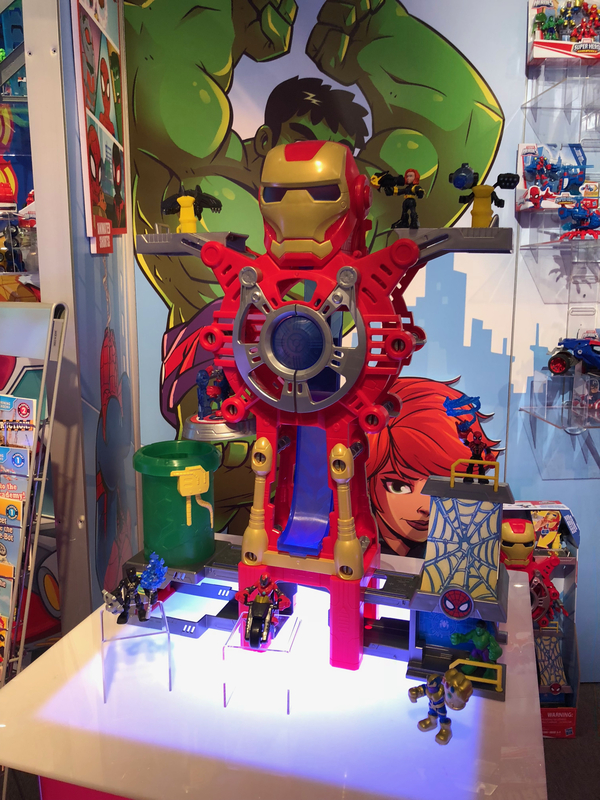 First is the 26-inch Iron Man play set, which is compatible with all of the Marvel Super Hero Adventures. 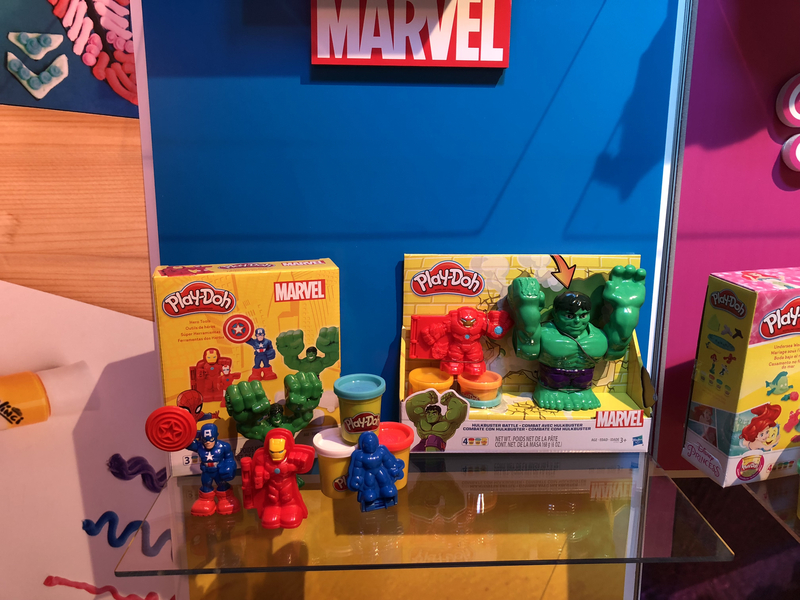 Play-Doh also has two new play sets that help kids create their own Marvel fun. 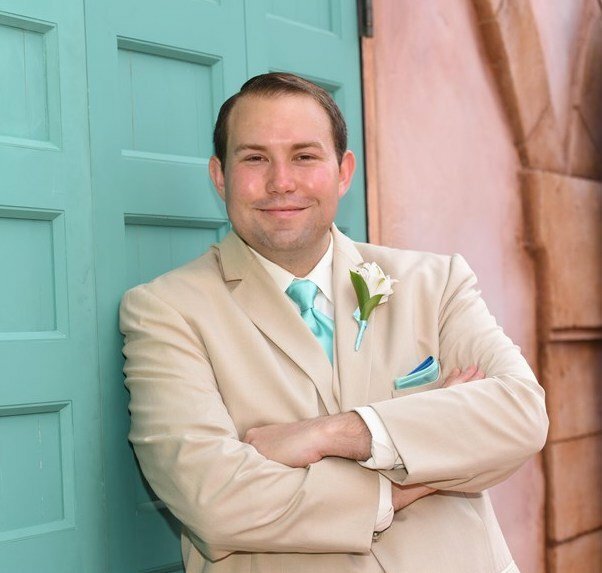 Lastly, Mr. 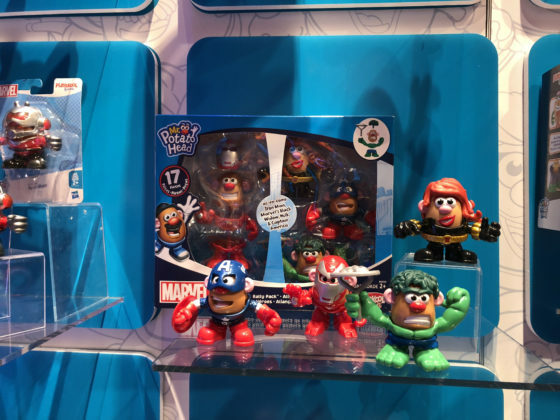 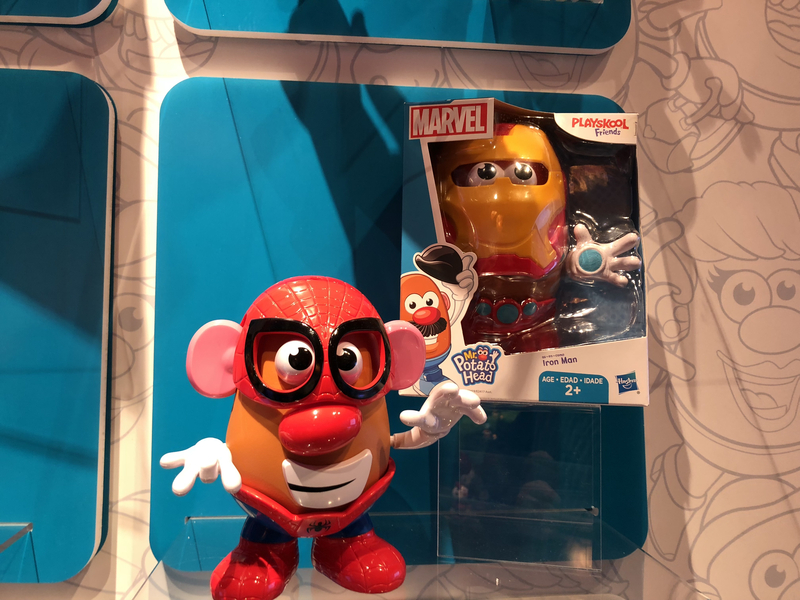 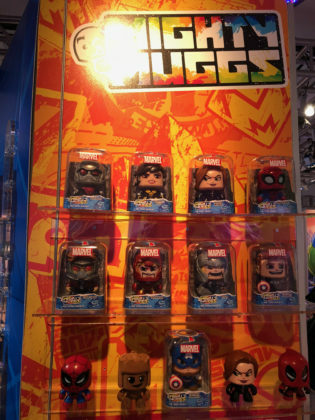 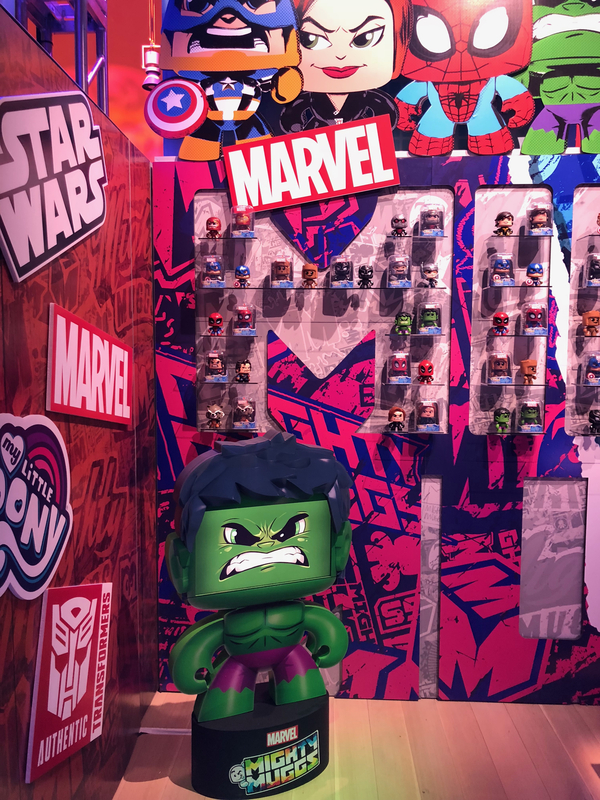 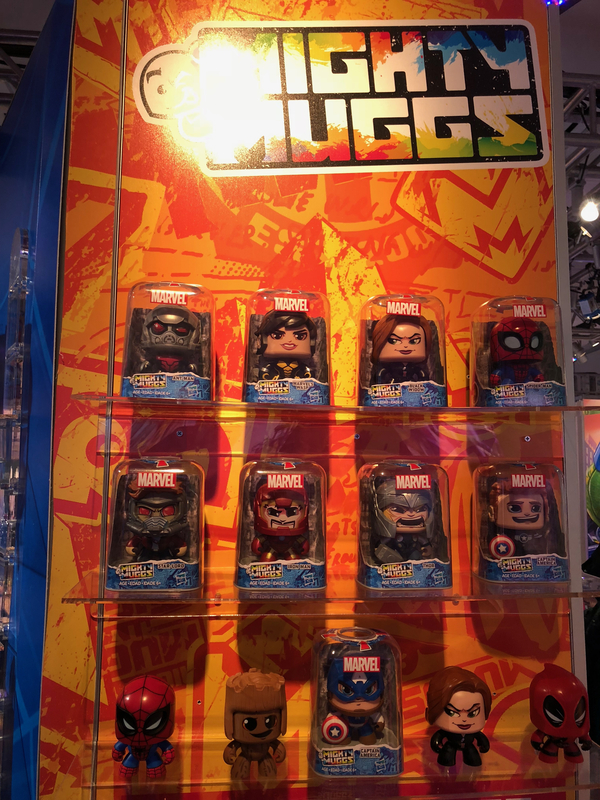 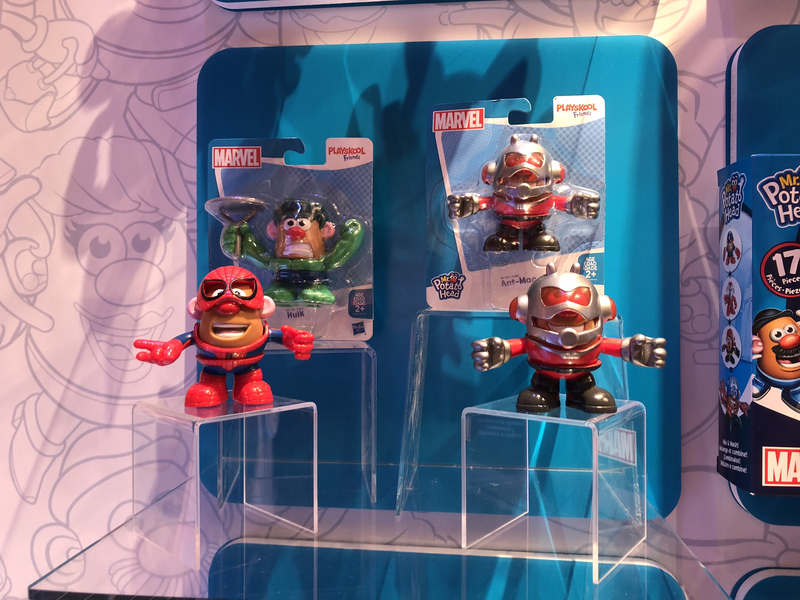 Potato Head has Marvel-themed sets in several sizes. Classic size is available as Iron Man or Spider-Man, and a Hulk/Iron Man combo pairs the classic size with a mini Potato Head. 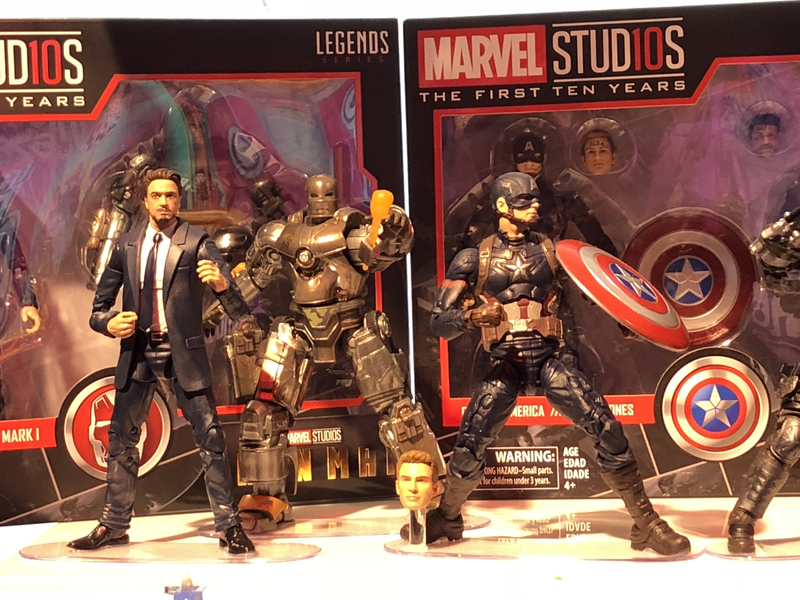 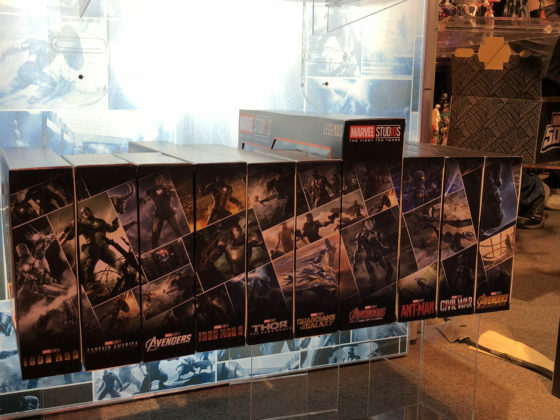 A four pack assembles Captain America, Iron Man, Hulk, and Black Widow. 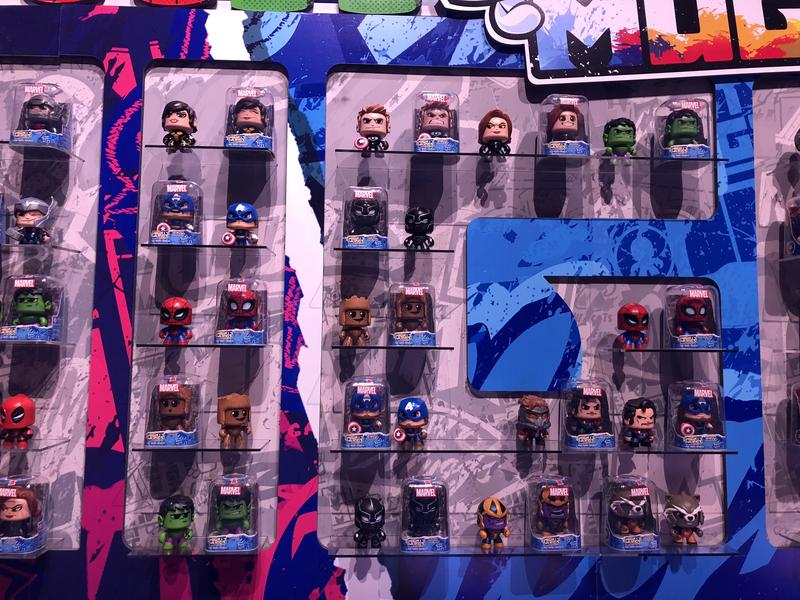 And smaller sets are available as Spider-Man, Hulk, and Ant-Man. 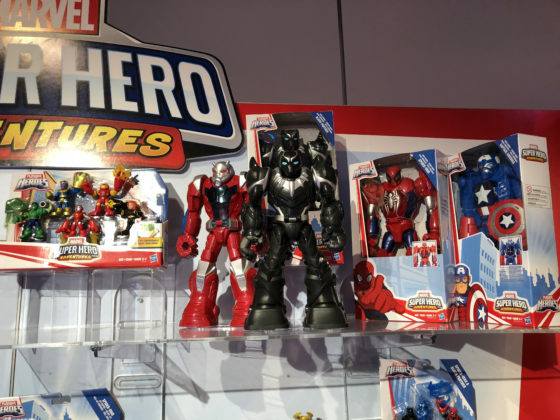 For Disney and Star Wars Hasbro toys, proceed to the next page.